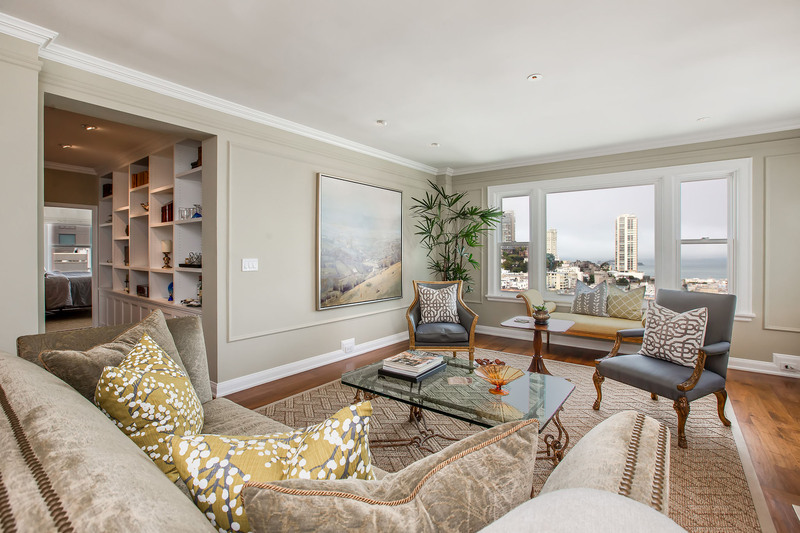 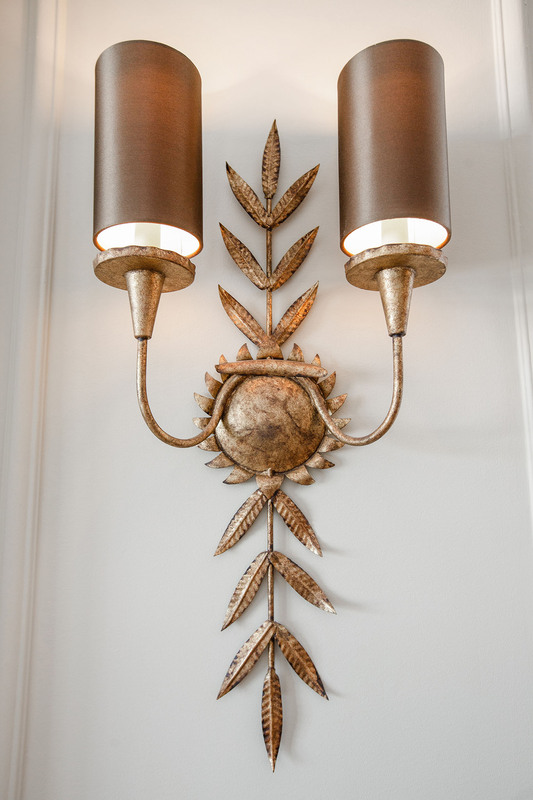 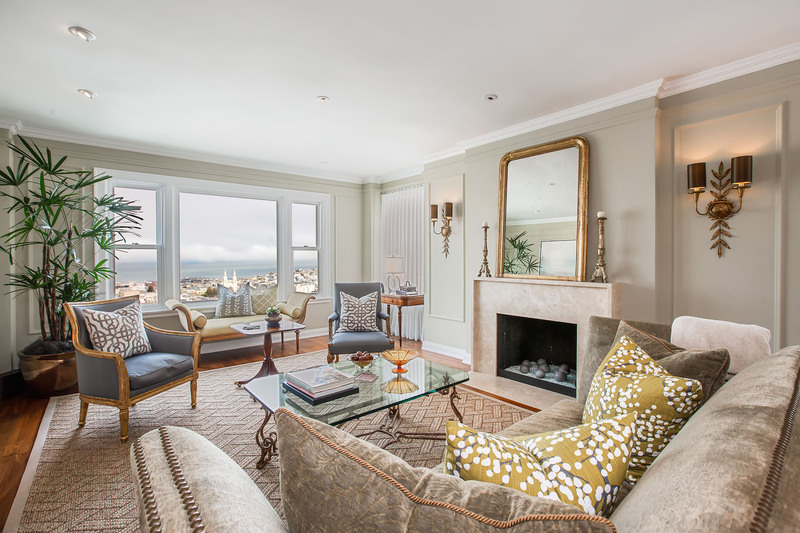 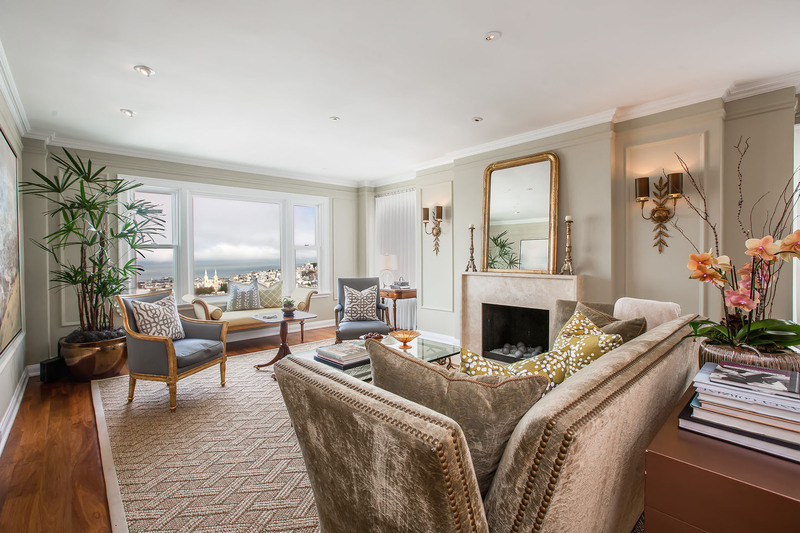 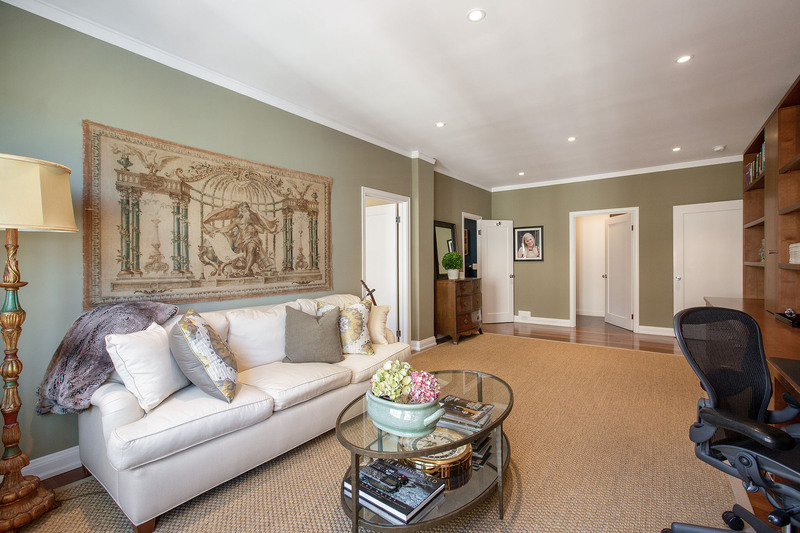 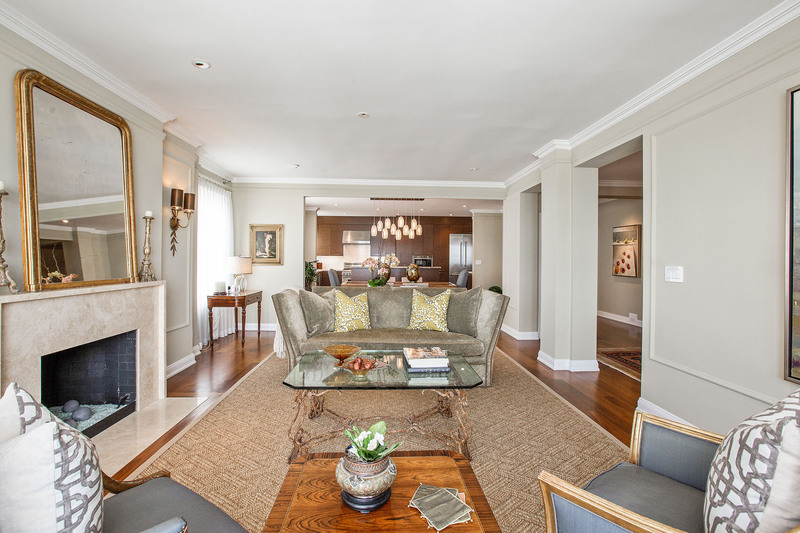 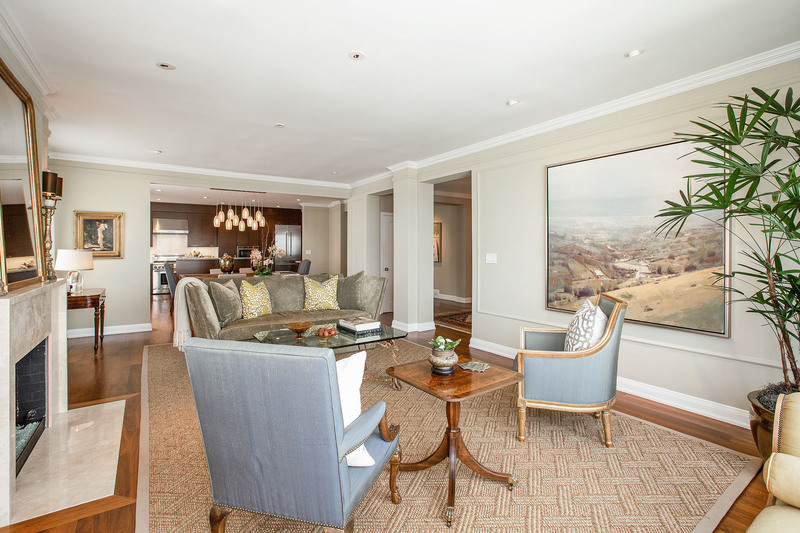 This exquisite residence at the Historic Park Lane features modern designer finishes, oversized rooms, significant architectural details, and sweeping views of the San Francisco Bay. 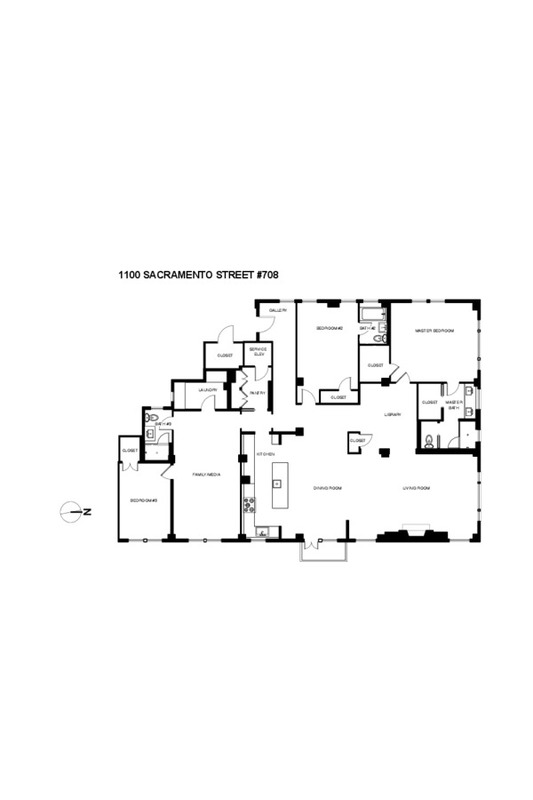 One of the largest floorplans available in the building, measuring over 2,700 square feet, this home offers three bedrooms and three full bathrooms plus a family room / library. 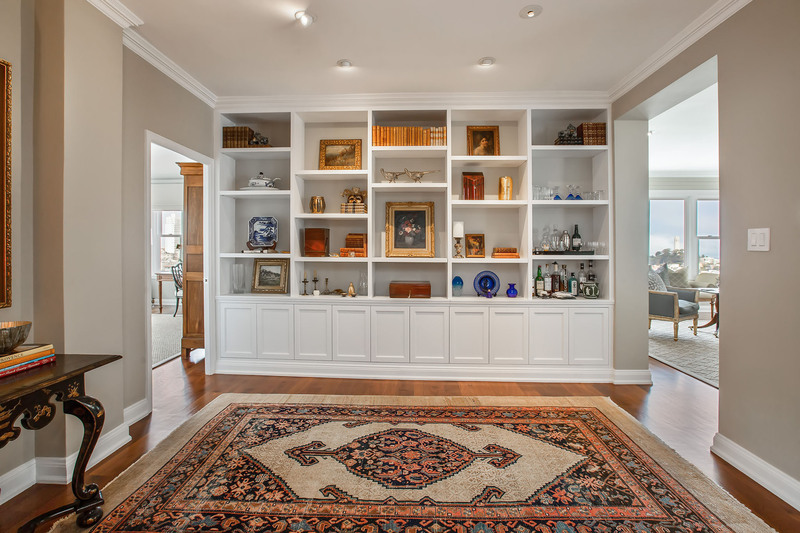 Stepping into a graciously appointed entryway, lit by a west-facing window and a striking chandelier, one can fully appreciate the superior quality finishes throughout: wide plank walnut wood flooring, crown and baseboard moldings, and recessed lighting amplified by gorgeous centerpiece light fixtures. 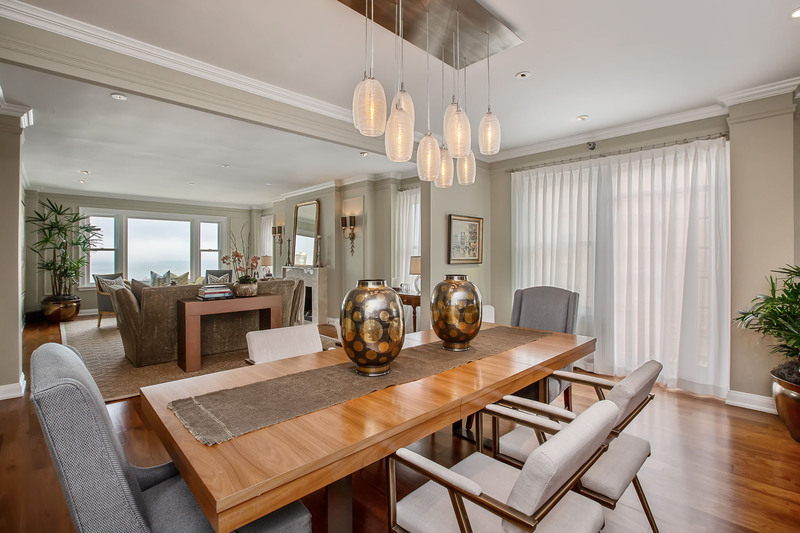 The entry hall opens up to a fabulous ‘great room’ – a long expanse of living, dining, and kitchen, all opened up to face the magnificent view through oversized north-facing windows. 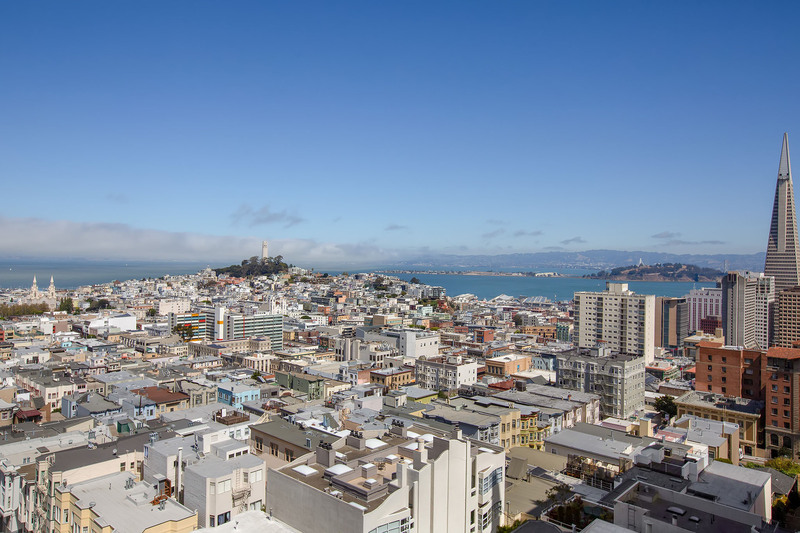 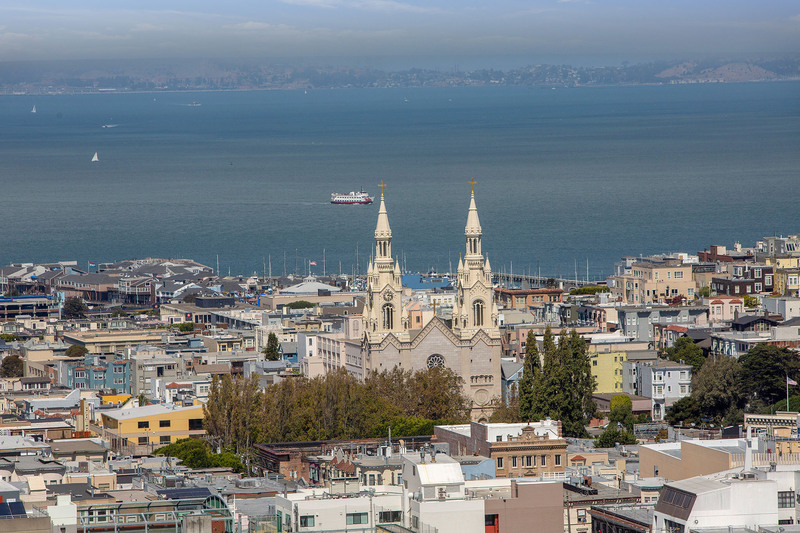 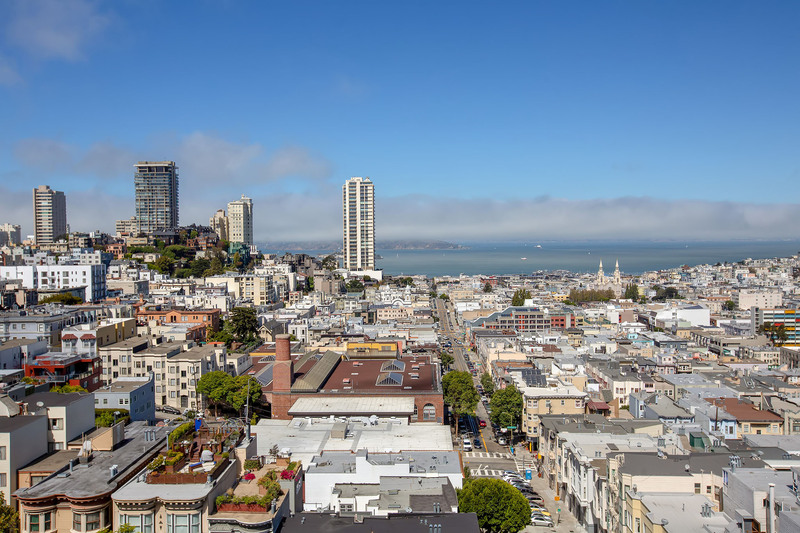 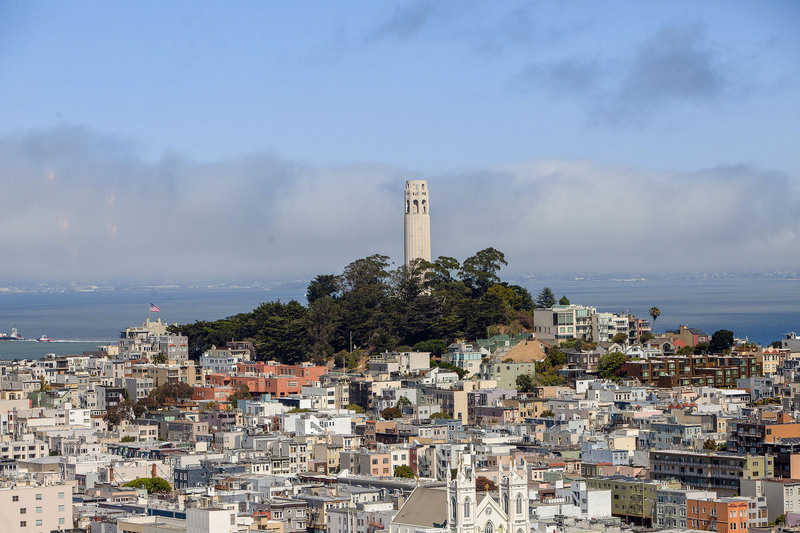 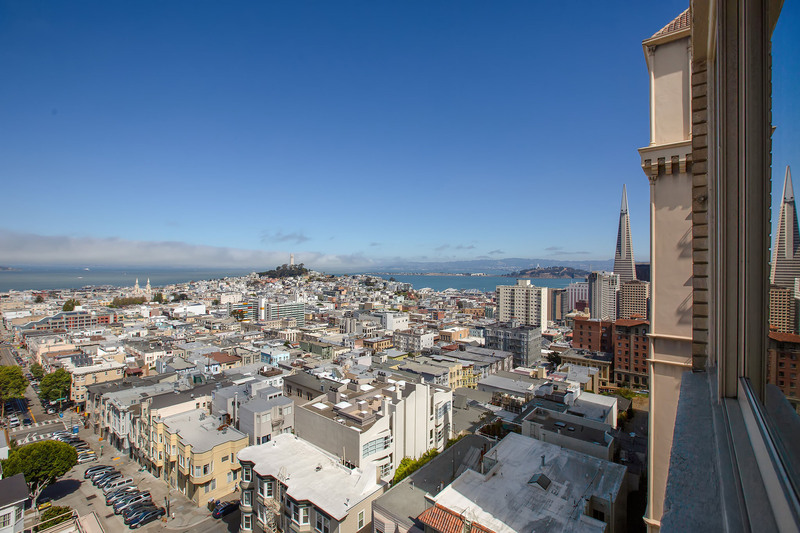 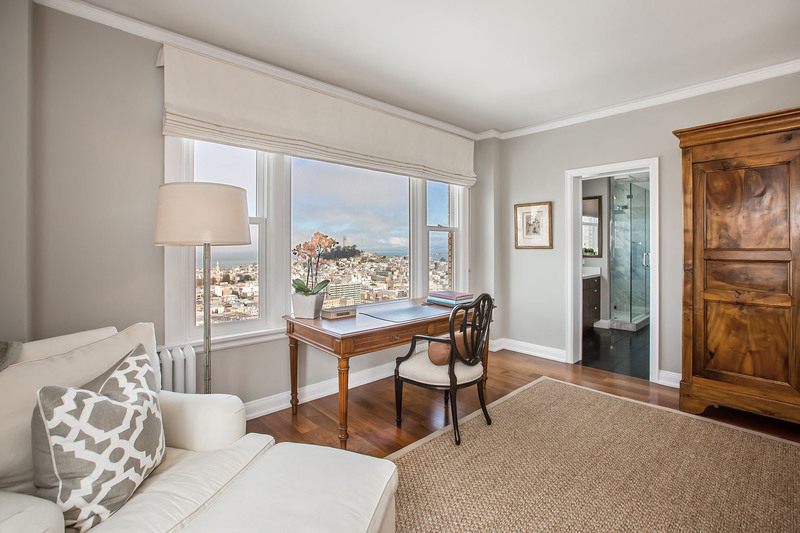 Sweeping outlooks showcase the San Francisco Bay, Alcatraz, Coit Tower and Treasure Island. 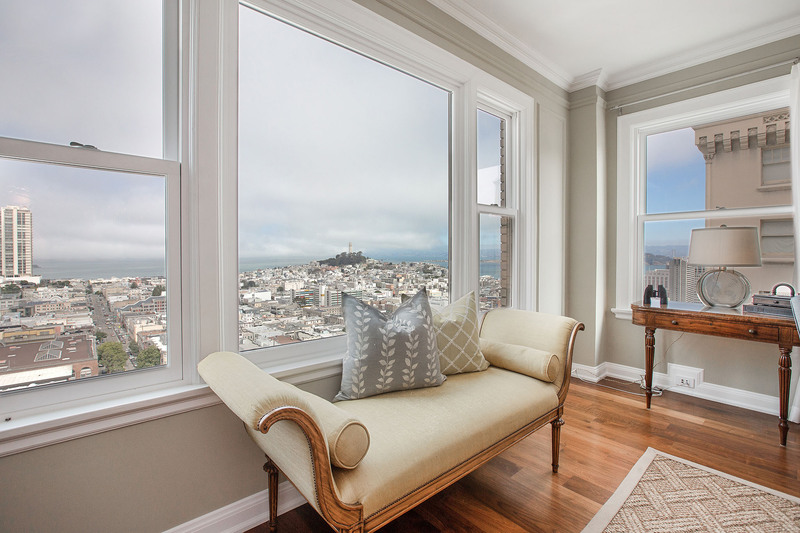 Windows to the east from the living room, flanking a chic pebble gas fireplace with stone mantle, allow for views of the East Bay, Treasure Island, the Bay Bridge and a peek at the Transamerica building. 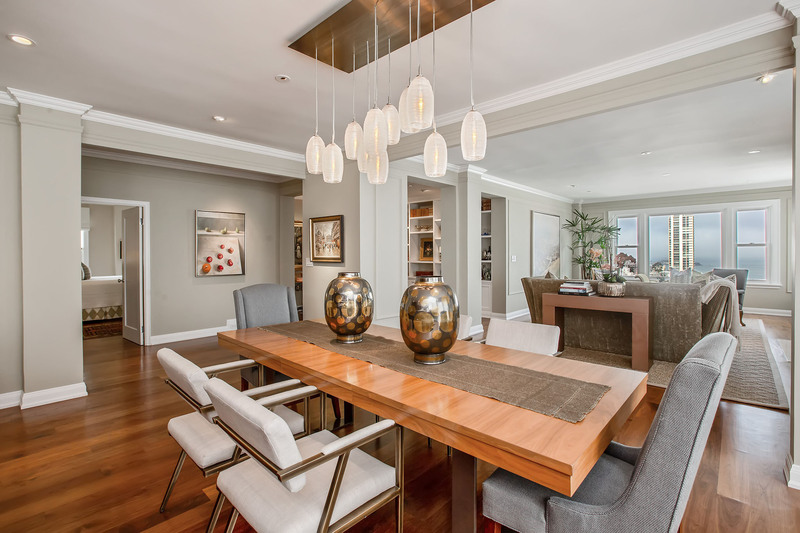 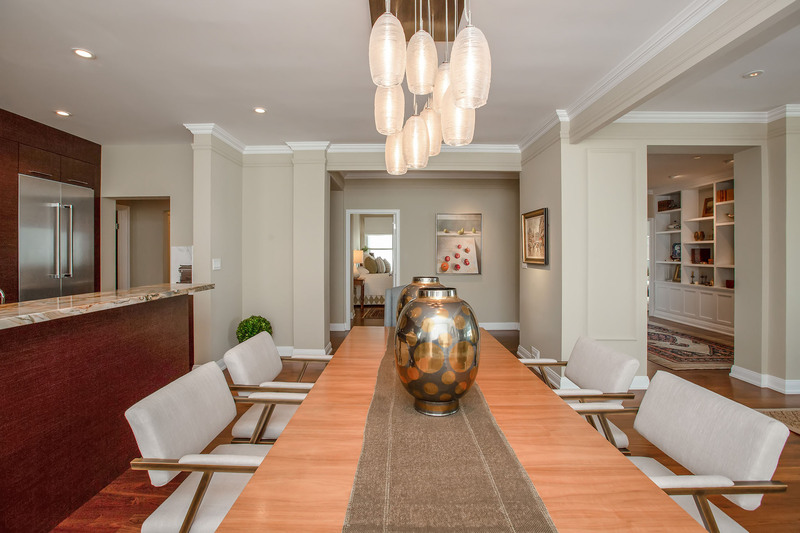 The lovely formal dining area is framed by another set of east-facing windows and a dazzling pendant chandelier. 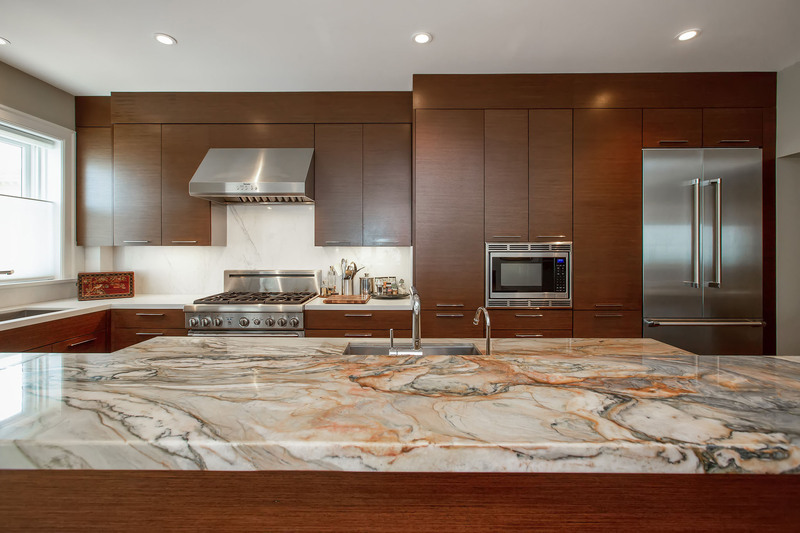 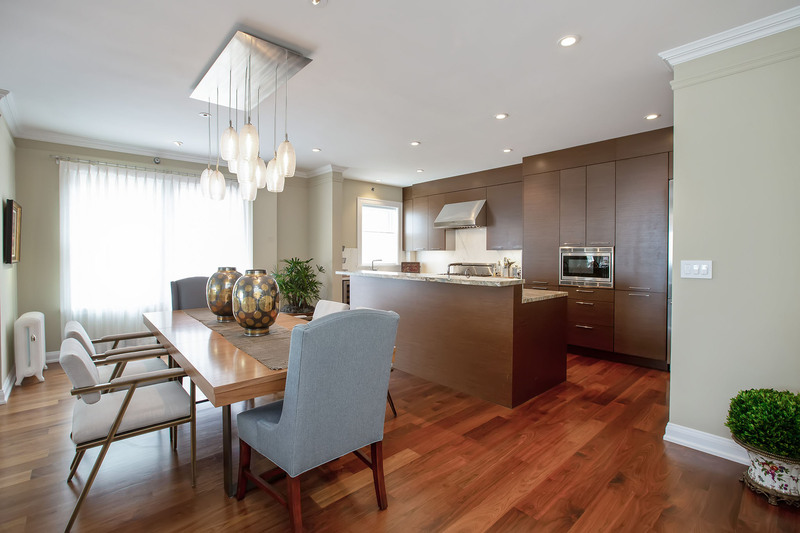 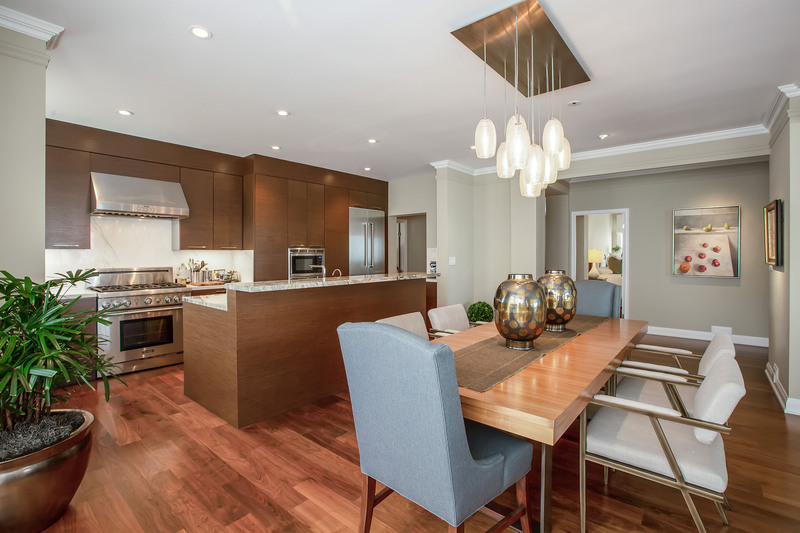 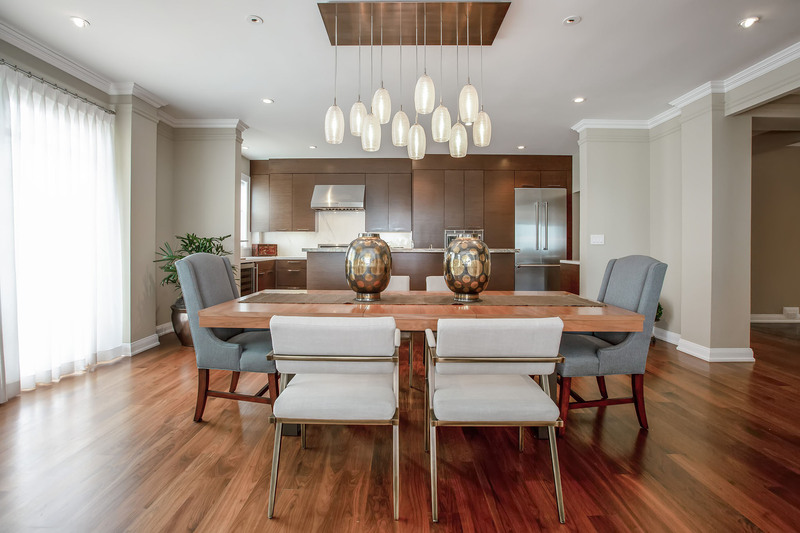 The open chef’s kitchen is absolutely gorgeous, with an exceptional granite-slab center island that functions as a raised bar for informal dining or display space above the prep space while admiring the views. 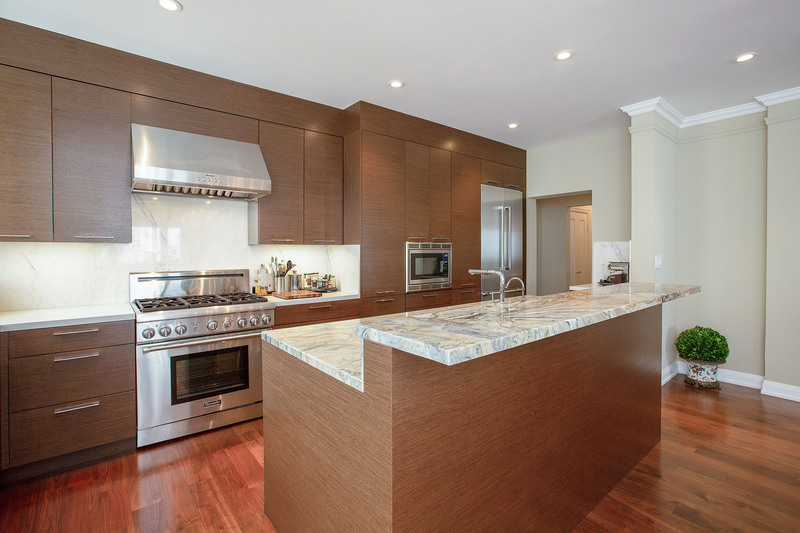 The island also houses a Thermador dishwasher and an oversized stainless steel sink. 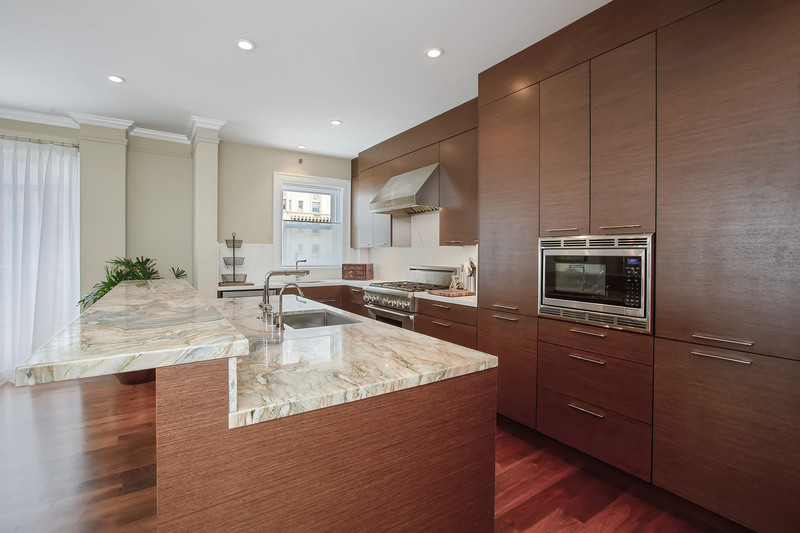 Curving around the back wall are white quartz countertops and a slab backsplash, rich walnut cabinetry, and luxe appliances including a stainless 6-burner Thermador gas range and hood, French door refrigerator and built-in microwave oven. 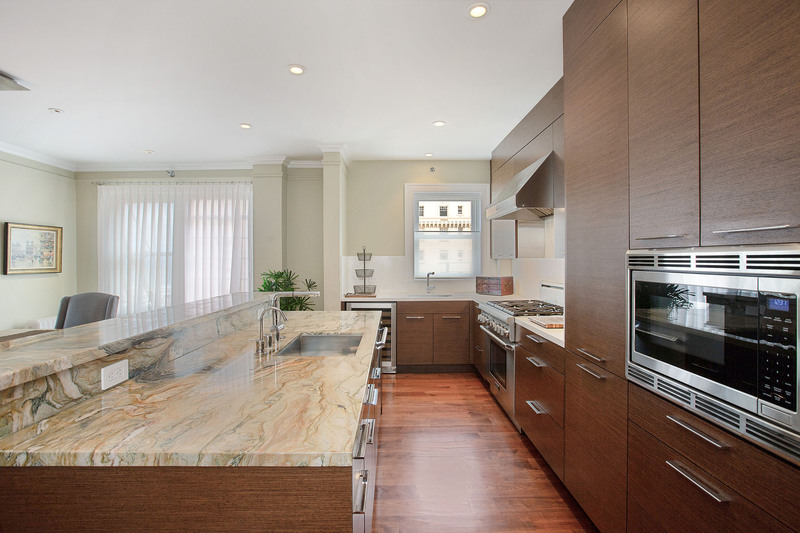 A wet bar area hosts a second sink and built-in wine refrigerator. 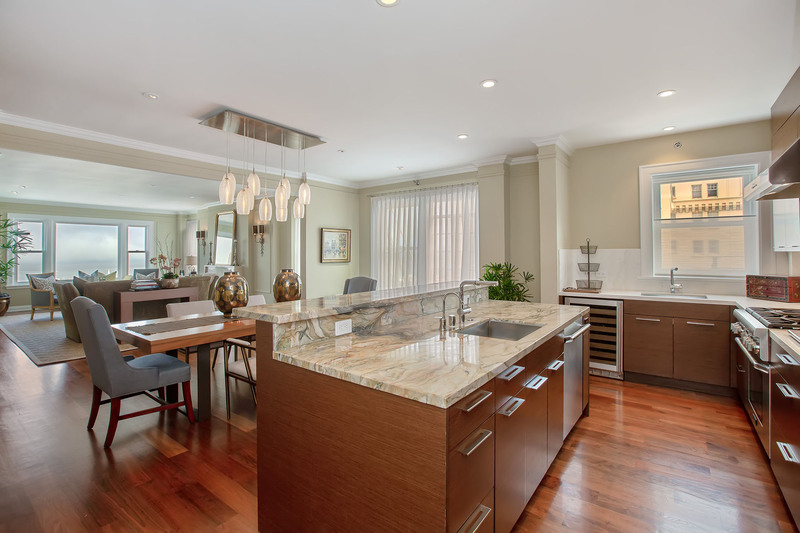 A separate coffee area completes the kitchen. 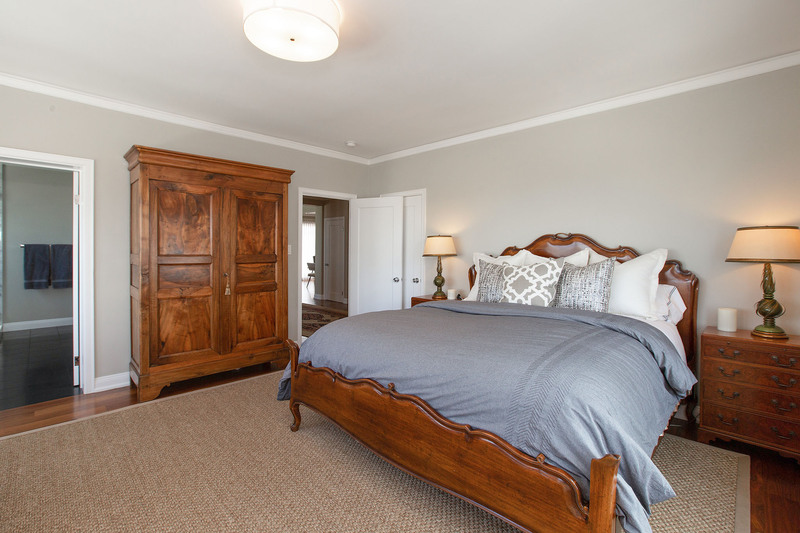 To the furthest north from the entry hall is the sumptuous master suite, boasting beautiful northern Bay views and two walk-in California closets. 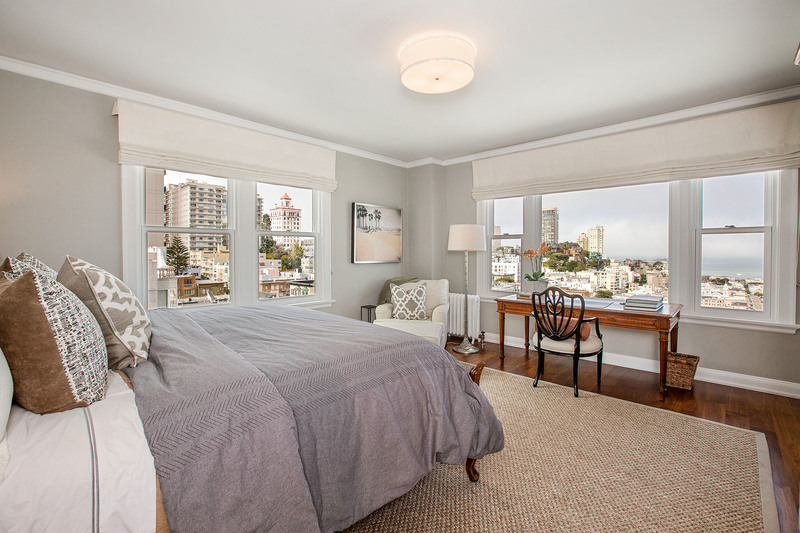 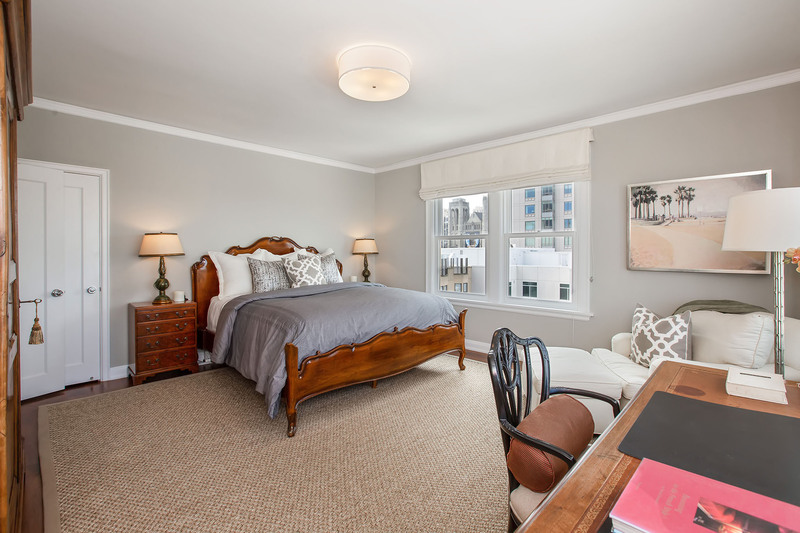 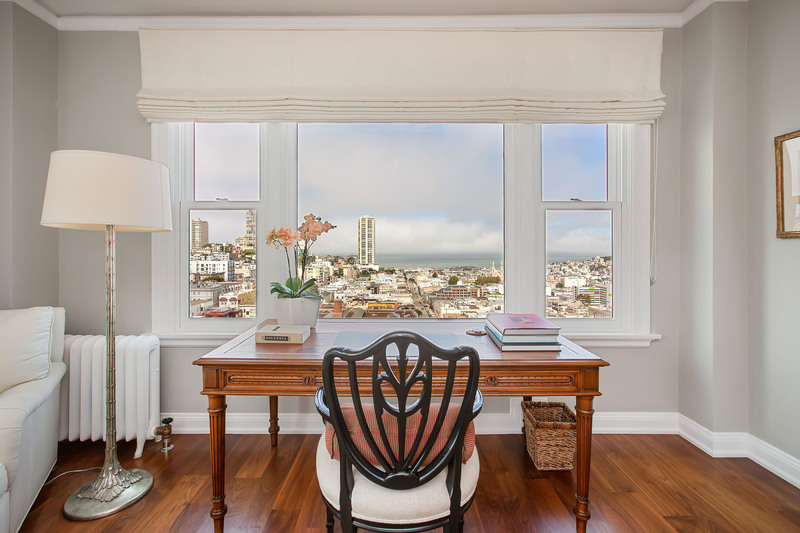 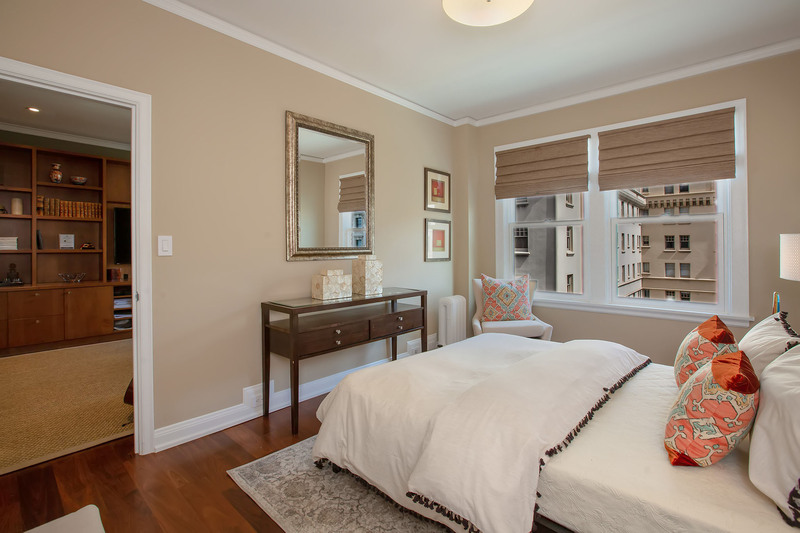 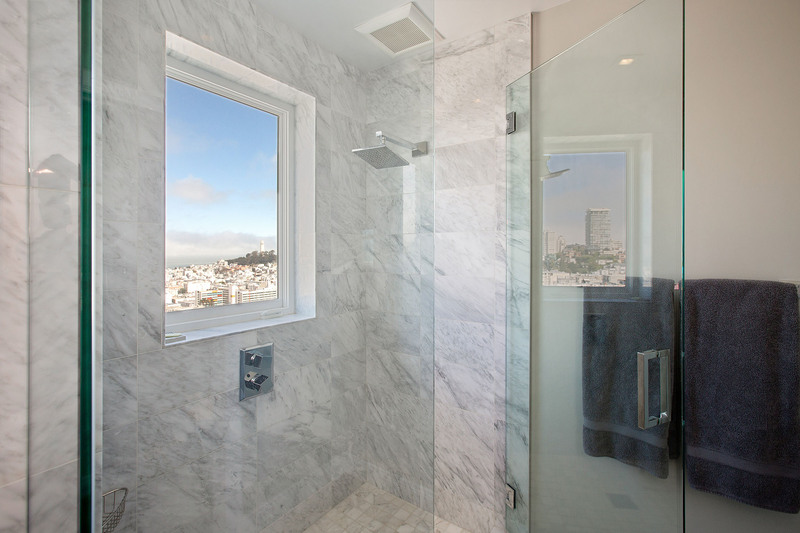 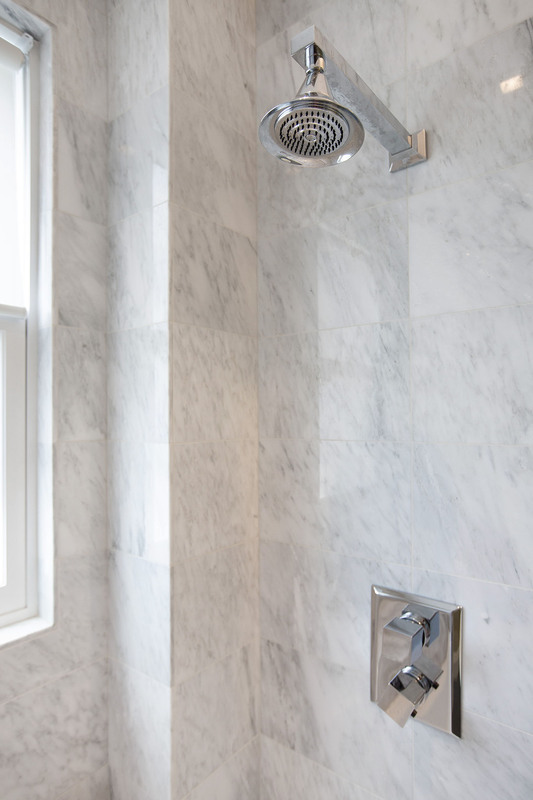 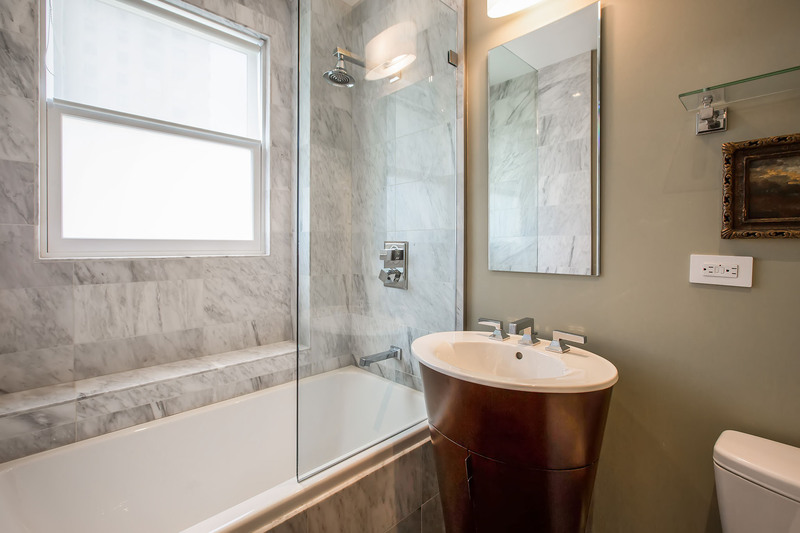 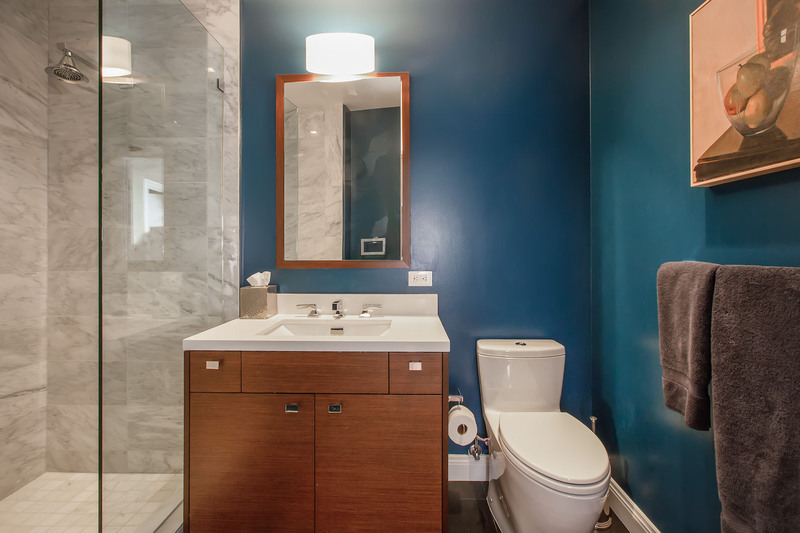 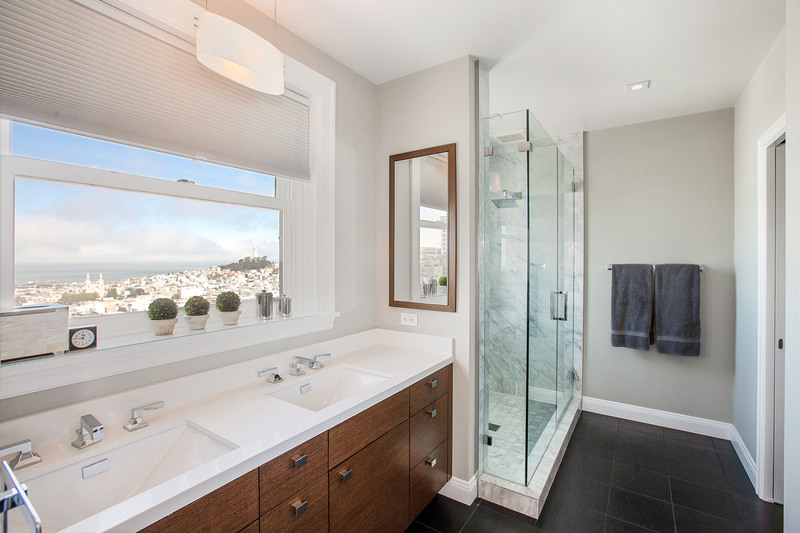 An attractive Carrara marble ensuite bathroom has a double vanity and a glass-enclosed shower with a picture window offering views of the Bay and Coit Tower. 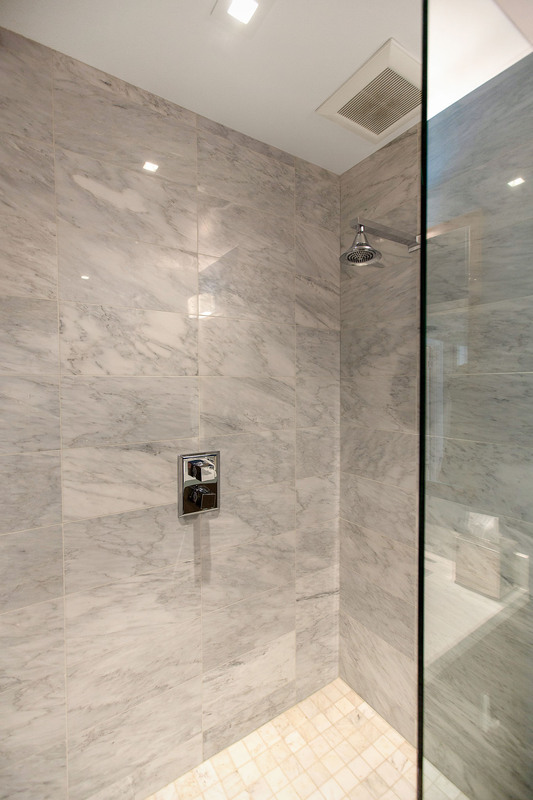 The second bedroom is large and outfitted with a walk-in closet and an ensuite bathroom with a Carrara marble shower over tub. 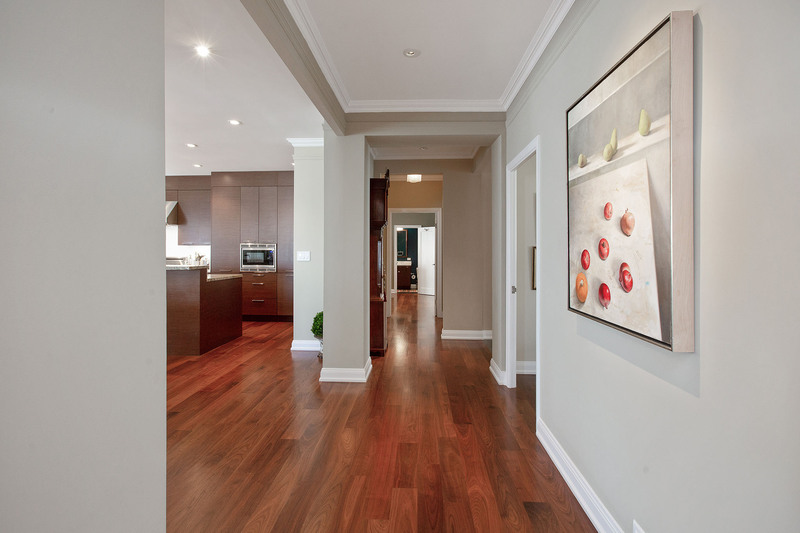 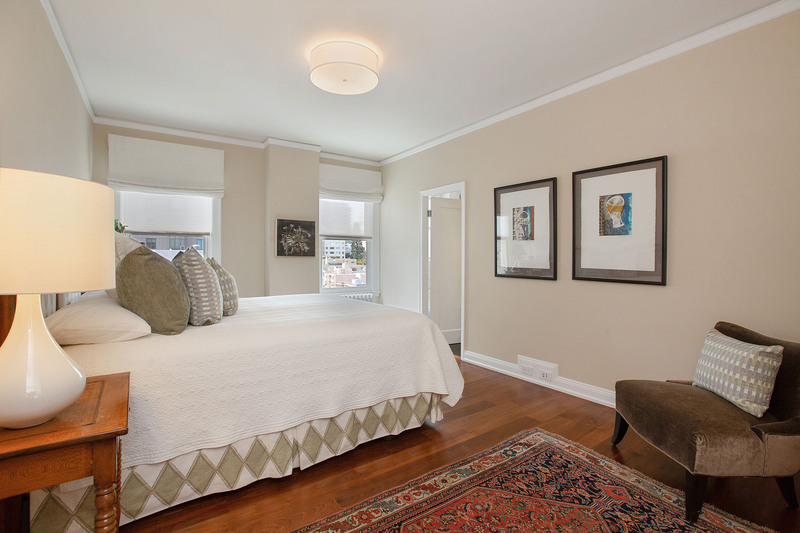 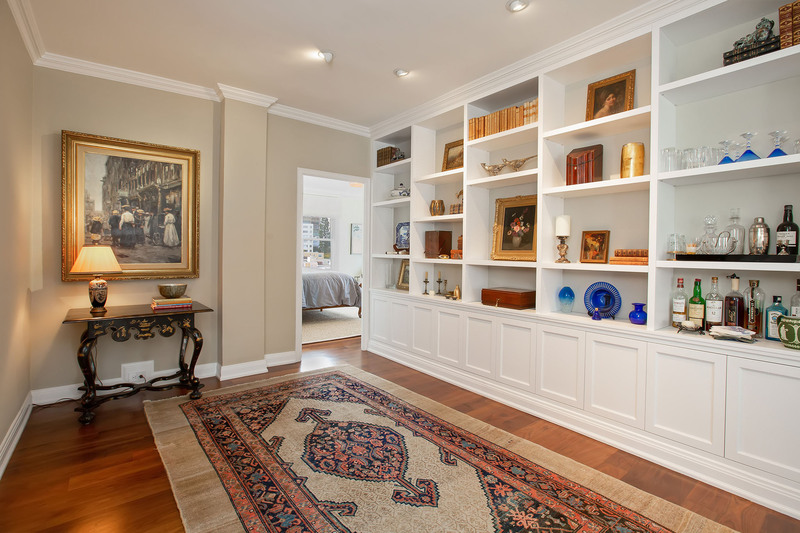 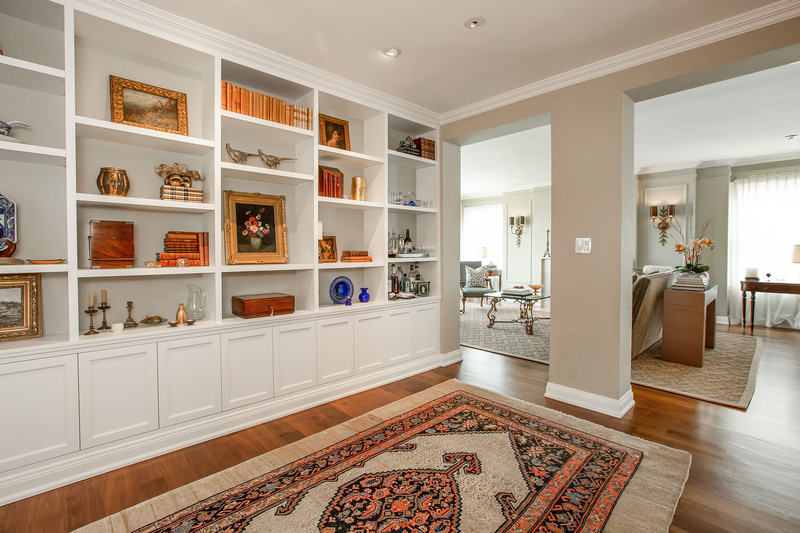 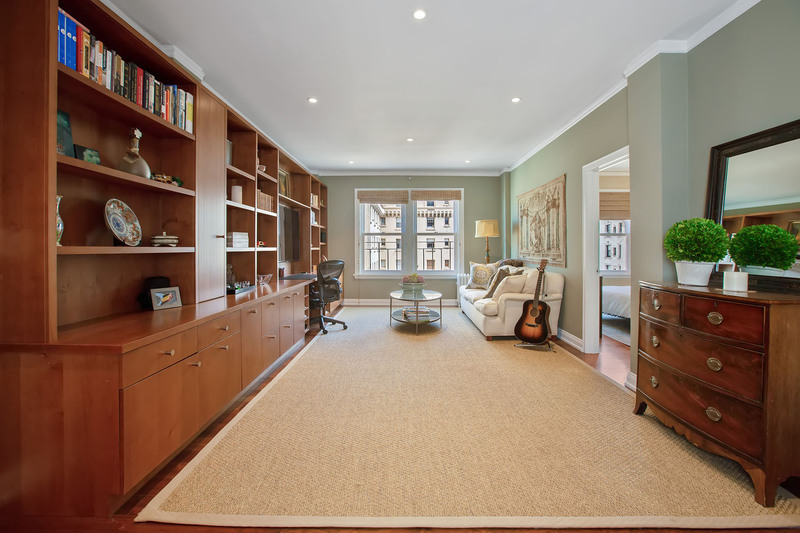 The landing outside both bedrooms displays a large built-in bookshelf, perfect for an extensive library or display art. 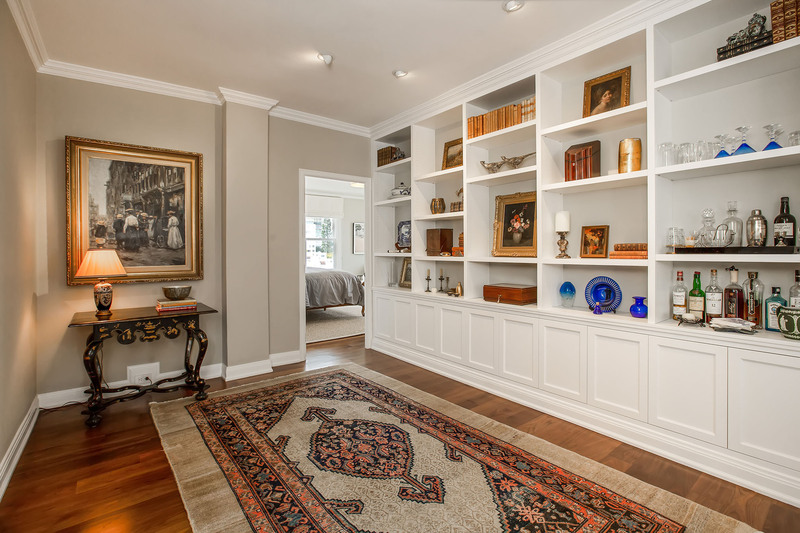 To the right of the entry is a convenient pantry/storage room with a number of built-in closets and the service elevator access, and past it is a wonderfully private guest suite plus a large family room. 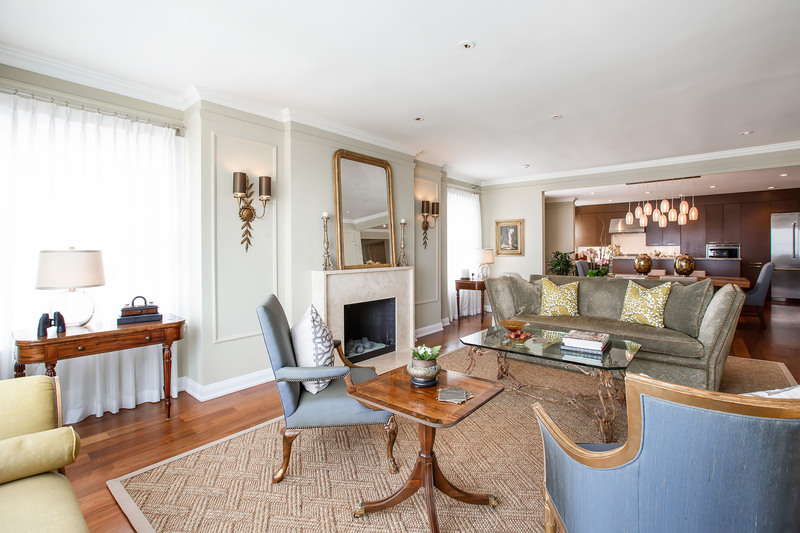 The family room, illuminated by Eastern light through large windows, is equipped with a wall-to-wall built-in desk and entertainment center. 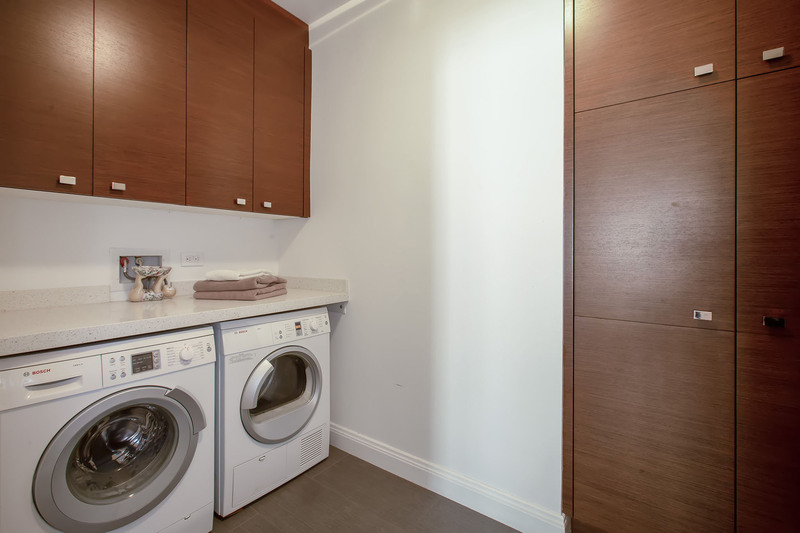 There is also a separate laundry room with tile floor, side-by-side Bosch washer and dryer, storage closet, cabinets and a stone folding counter. 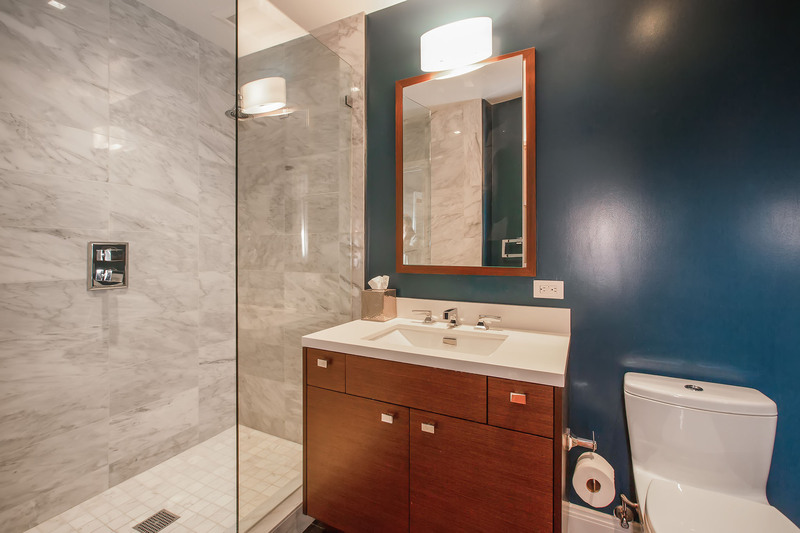 Off the family room is a third bedroom with walk-in closet and third bathroom, showcasing black tile floors, a Carrara marble shower, and a quartz-topped vanity. 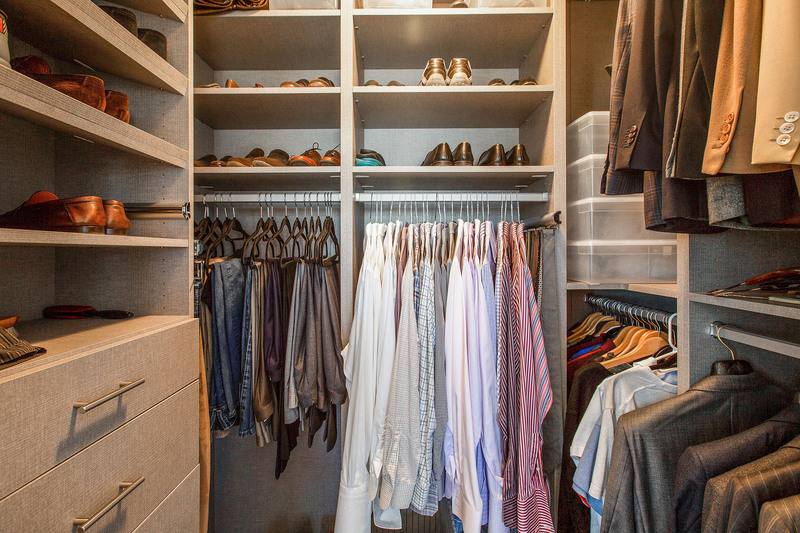 The unit also comes with two storage rooms, one just outside the apartment front door, and one car parking with charging outlet. 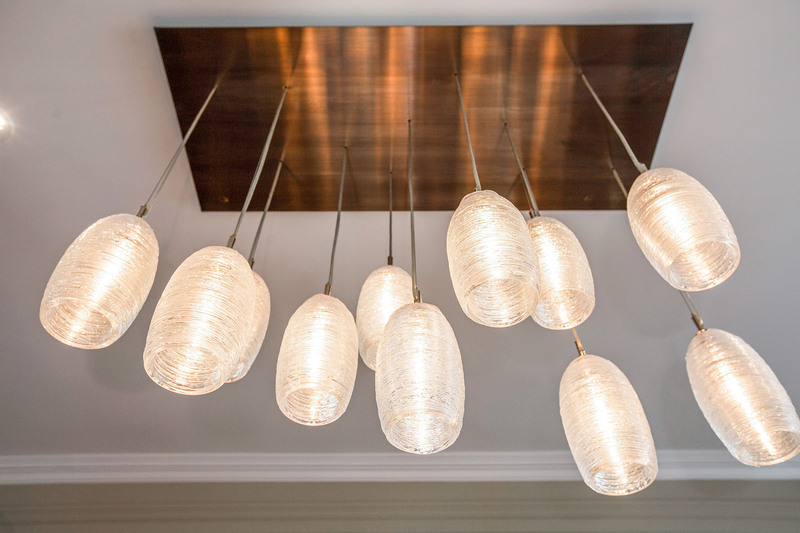 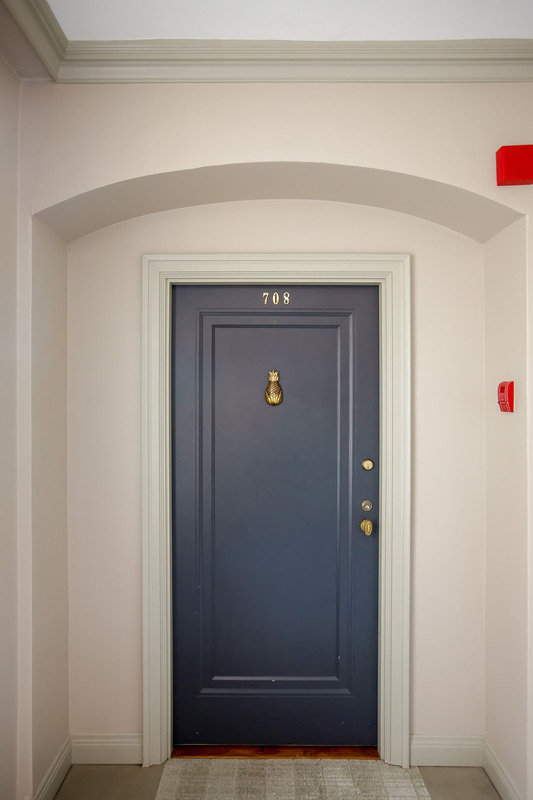 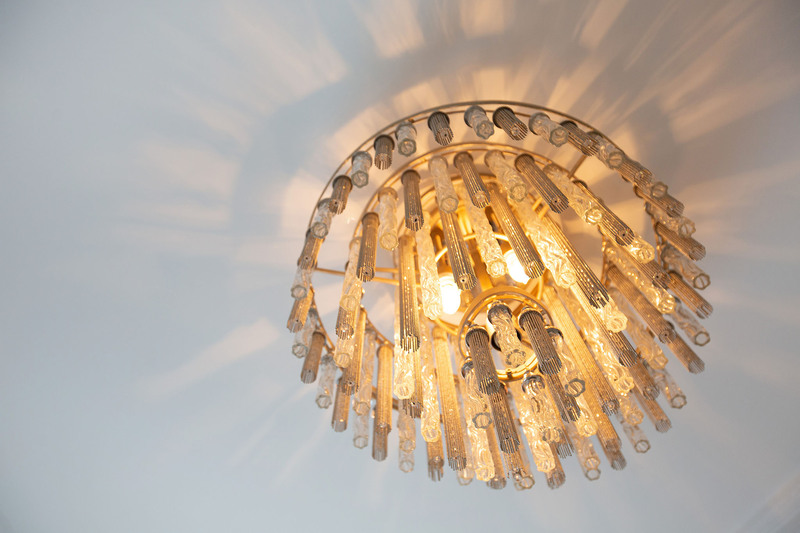 The Park Lane offers residents a full-time doorman, outside management, a beautiful common garden, and a gym. 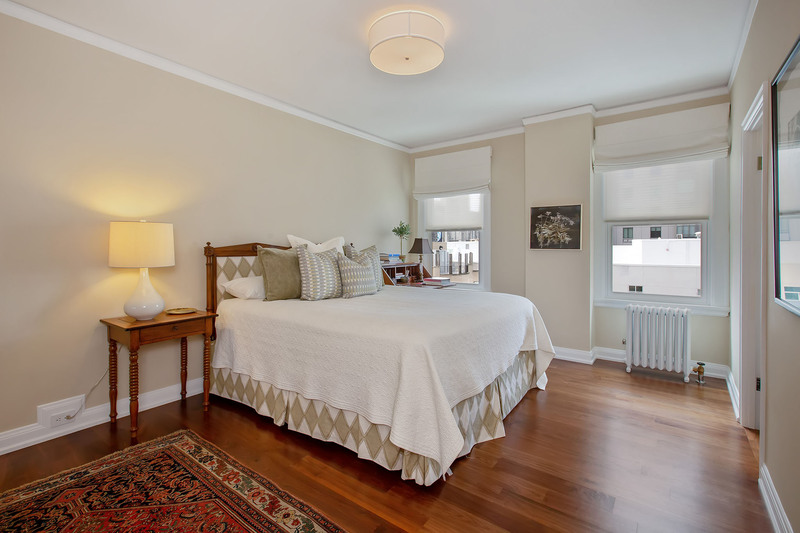 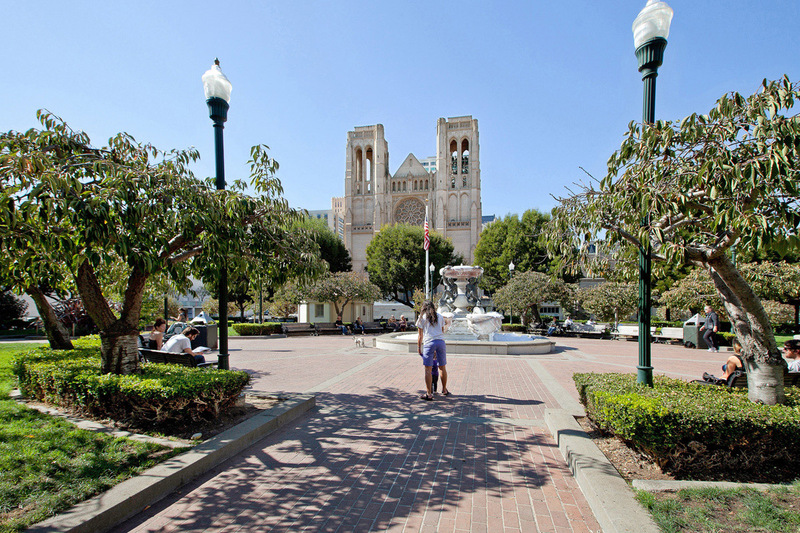 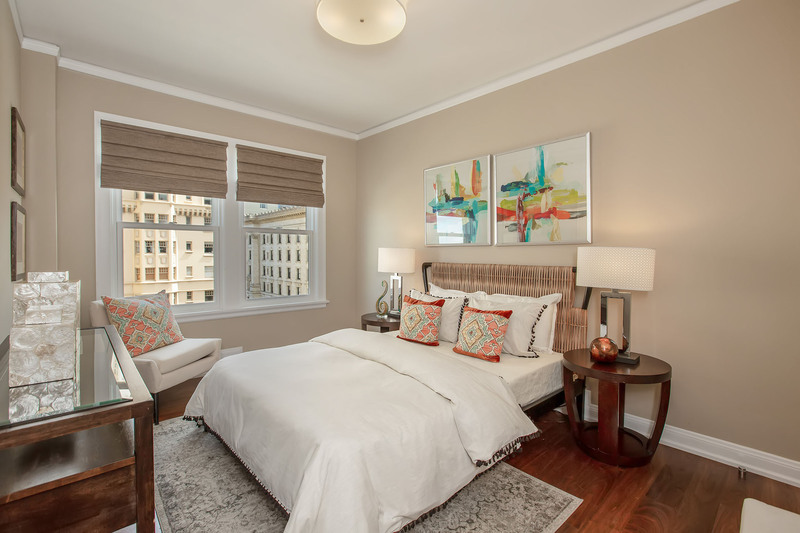 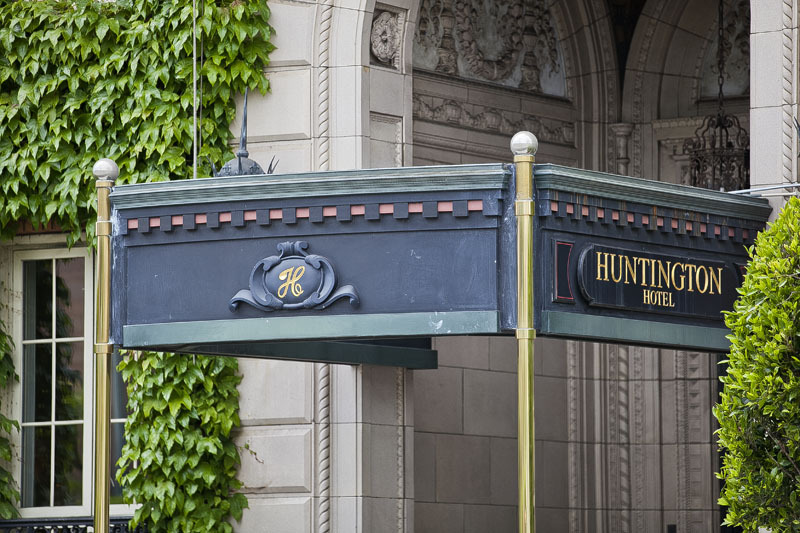 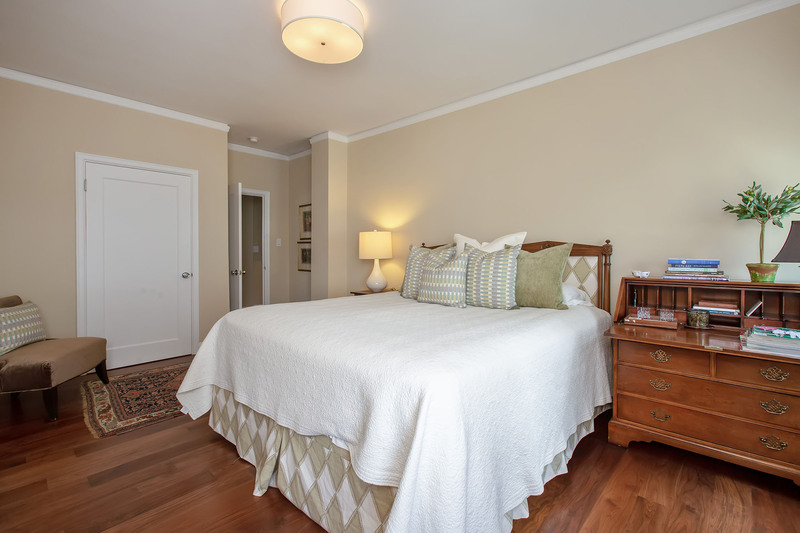 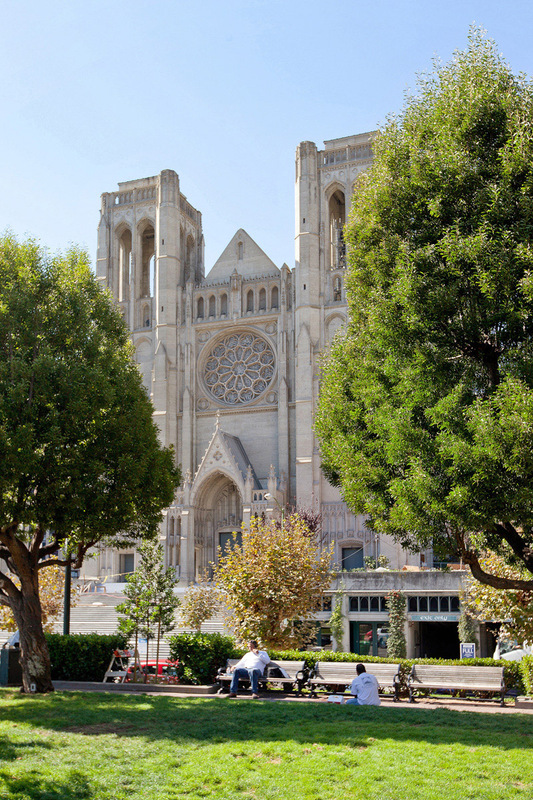 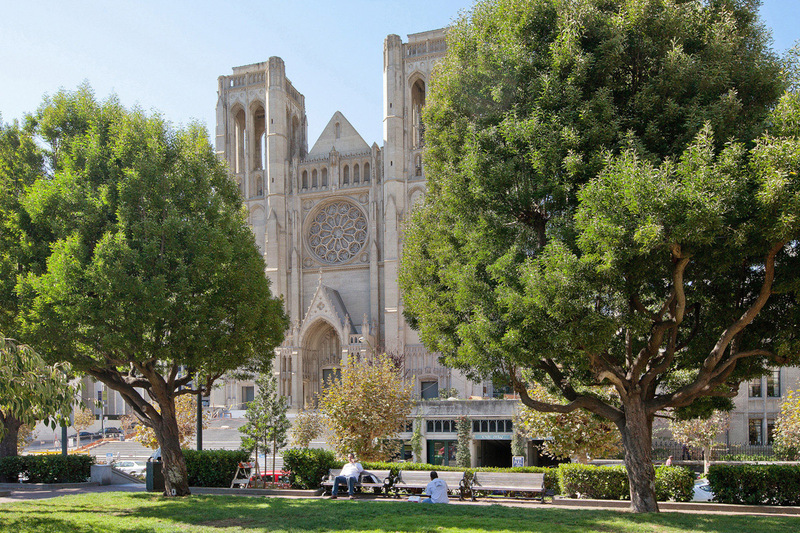 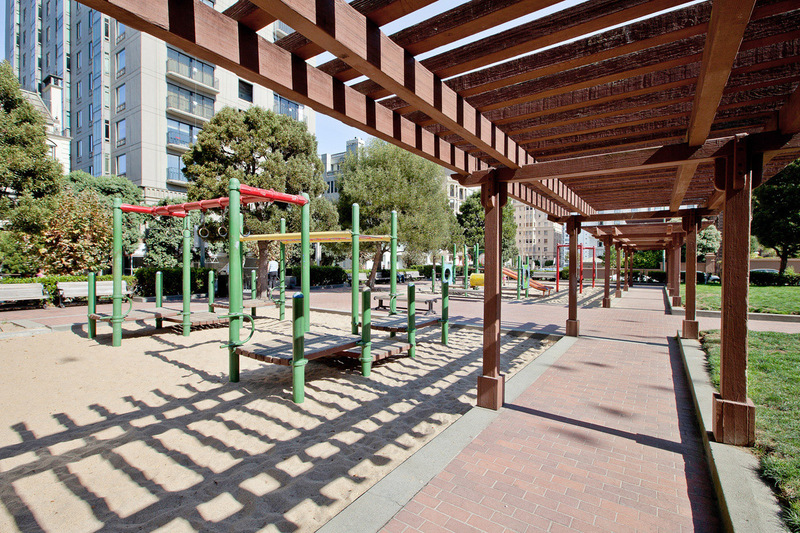 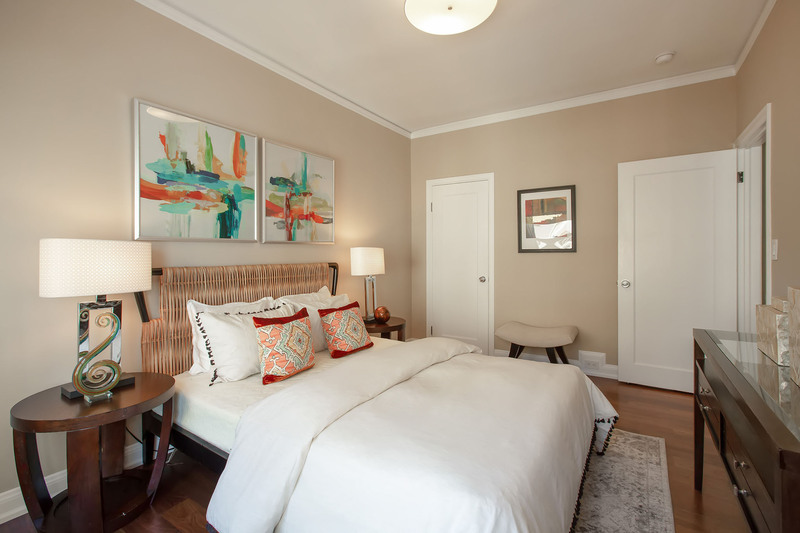 Located on one of the most desirable blocks of Nob Hill, across the street from Huntington Park and just steps from some of the city’s best restaurants and hotels. 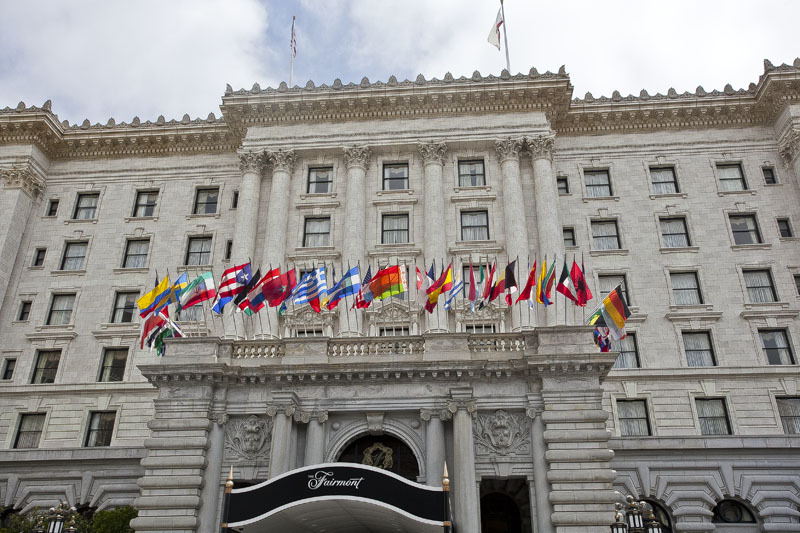 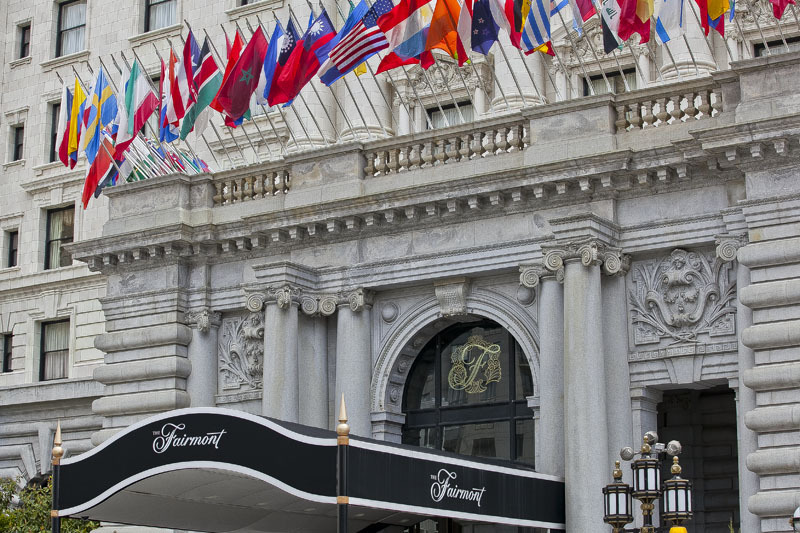 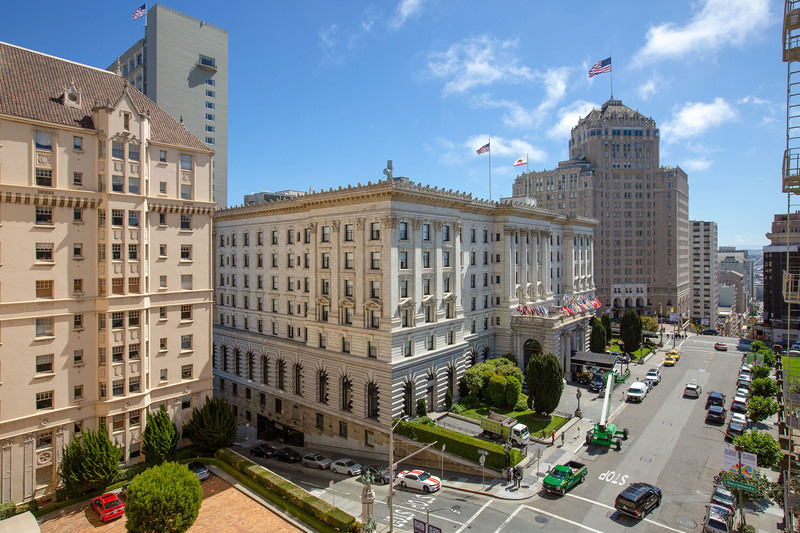 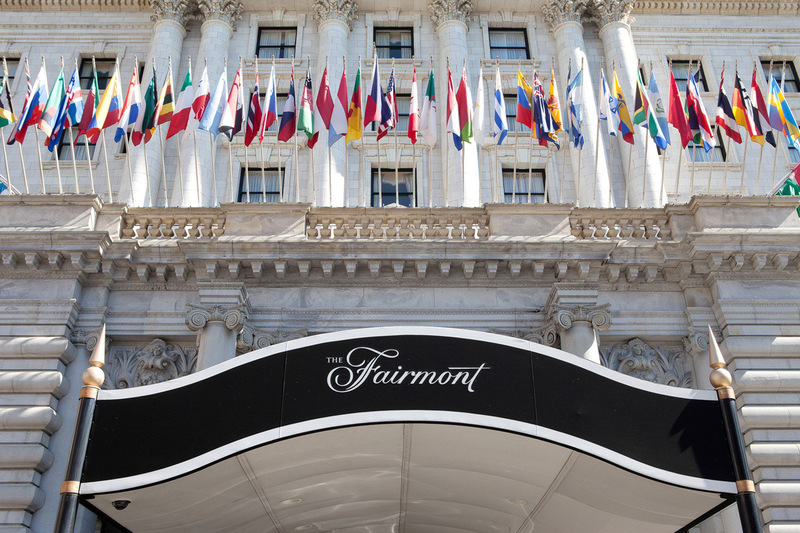 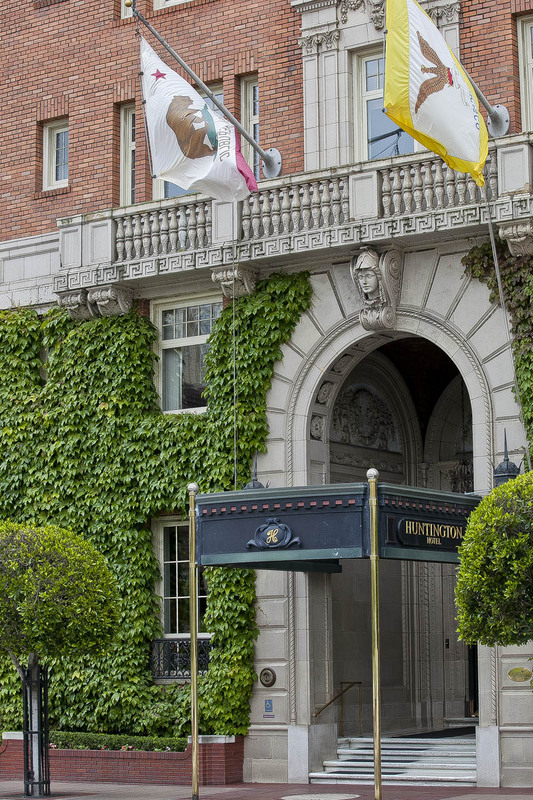 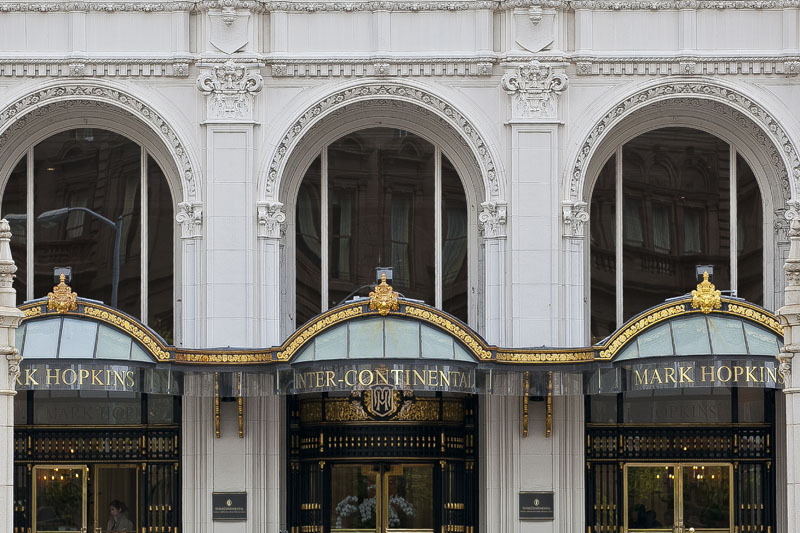 Exclusive and elegant, Nob Hill is home to some of the grandest mansions and most historic hotels one can find in San Francisco. 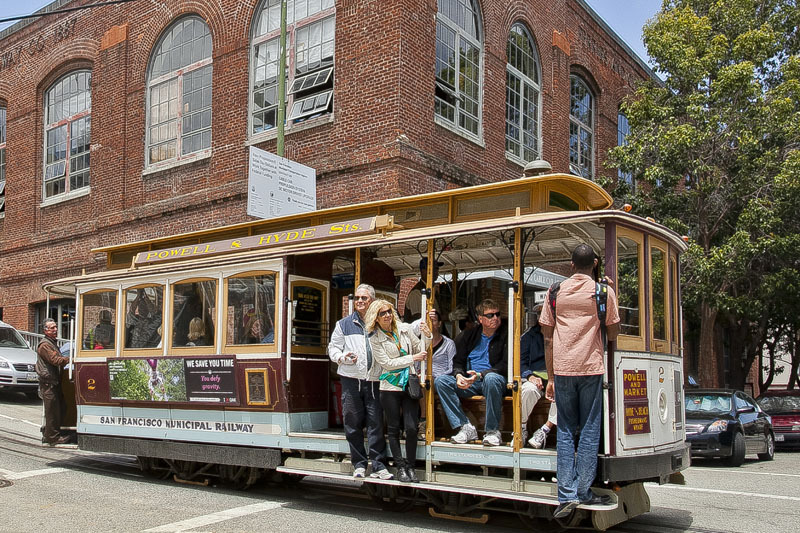 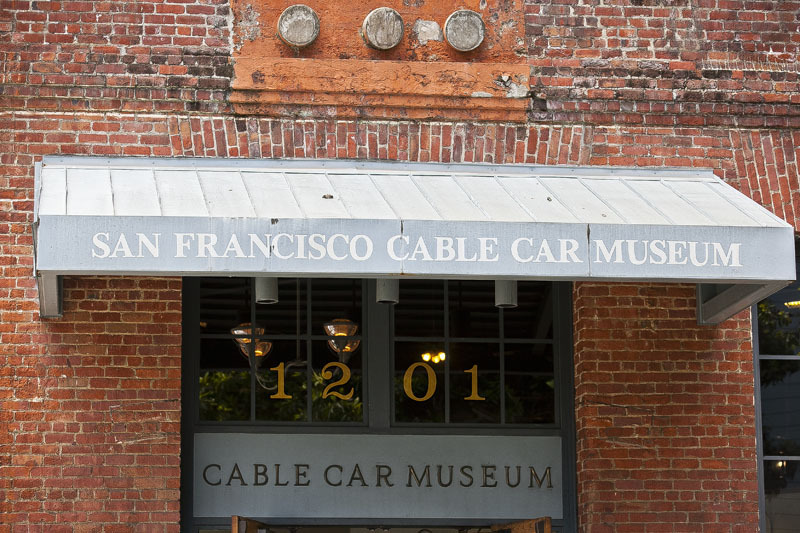 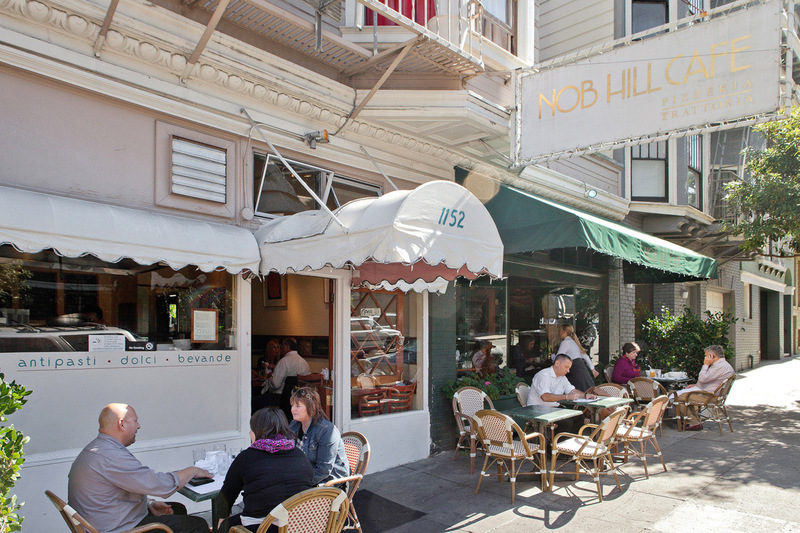 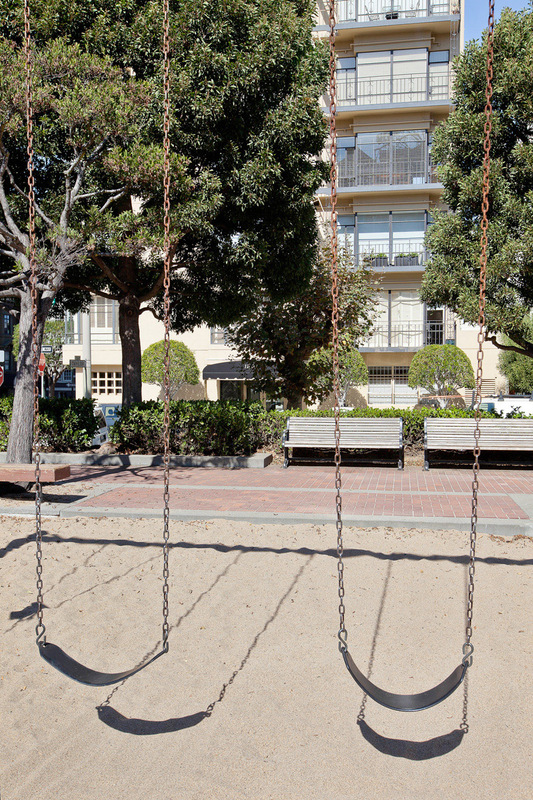 Nob Hill is part of an enclave made accessable in the 1870s by the addition of cable cars climbing up California Street through the heart of the neighborhood. 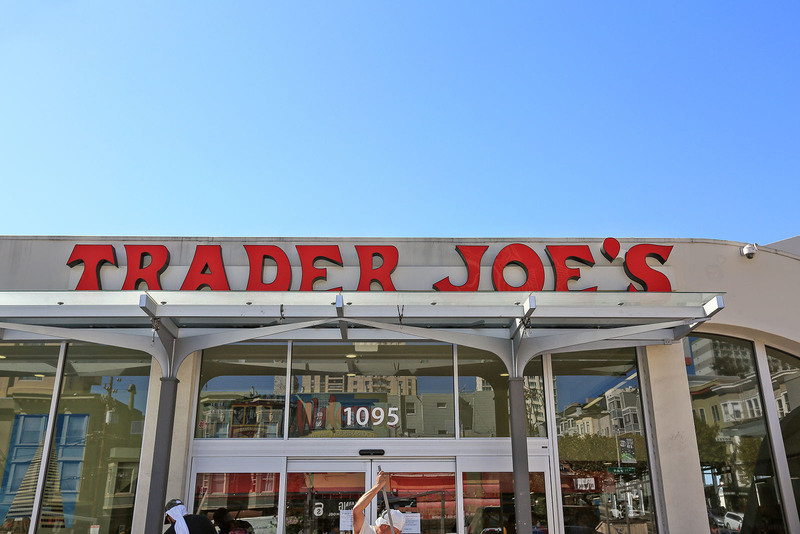 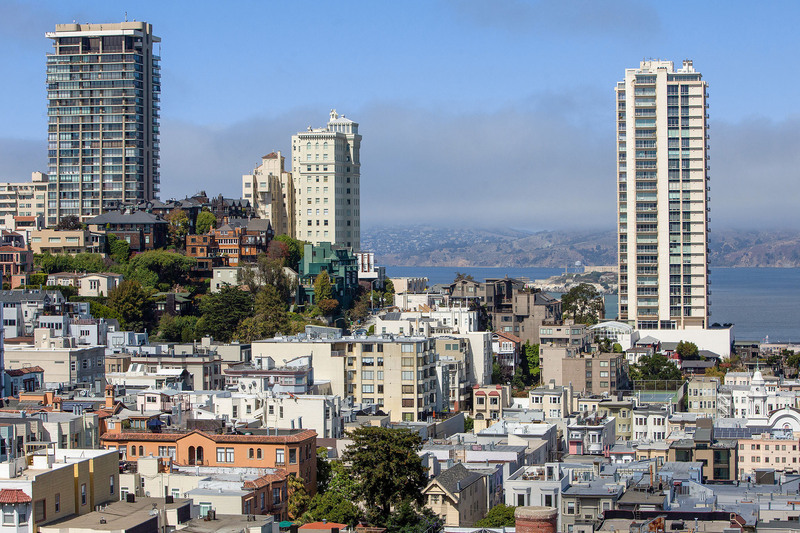 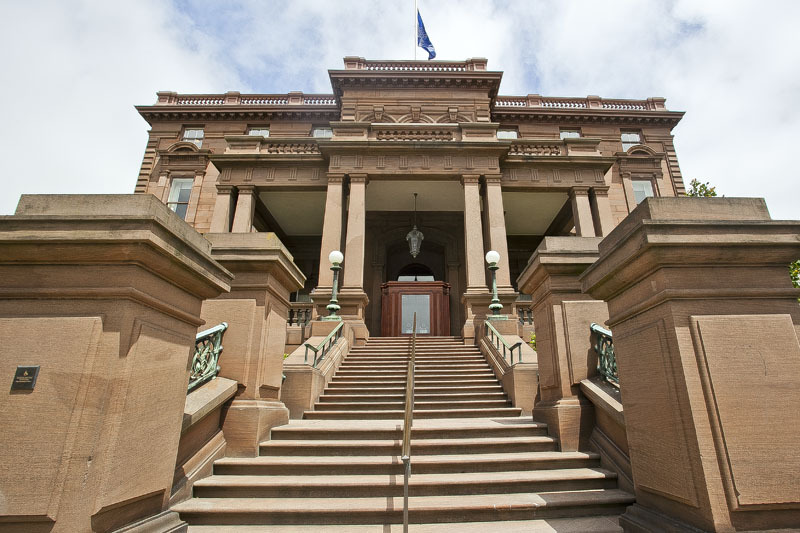 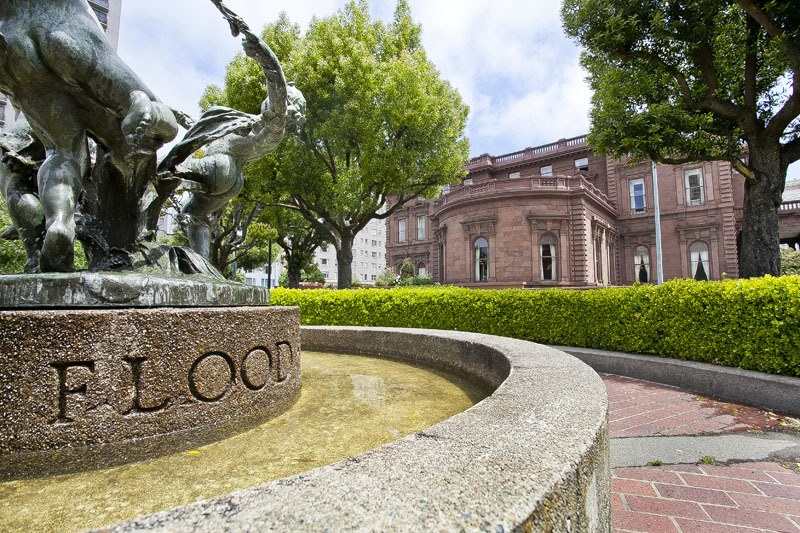 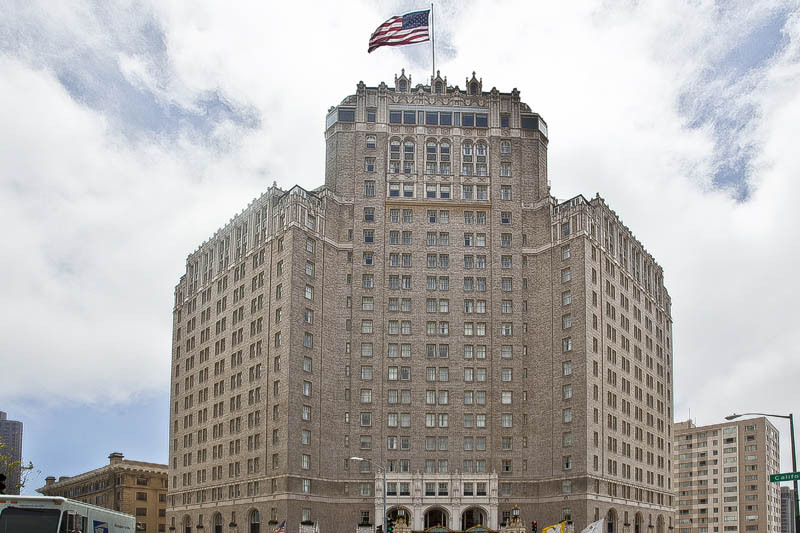 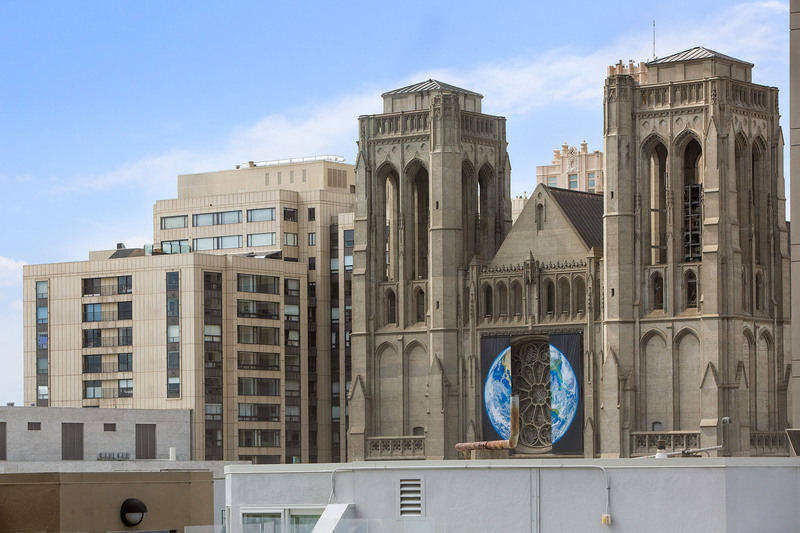 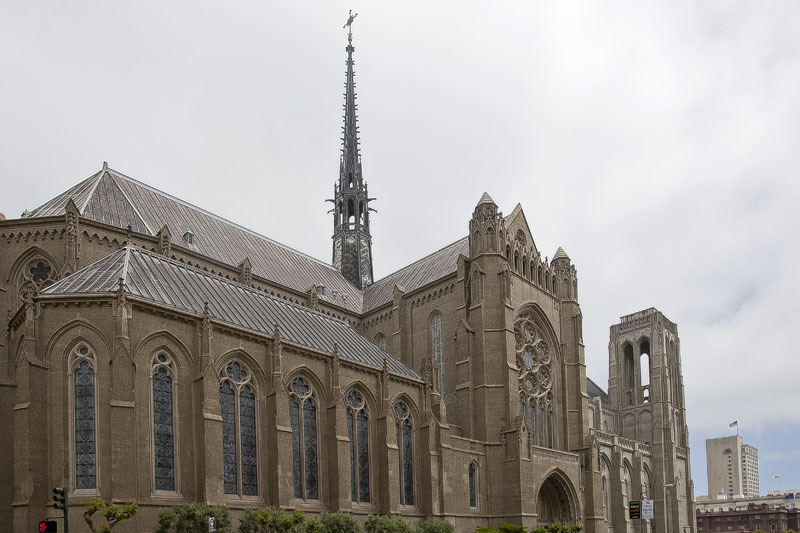 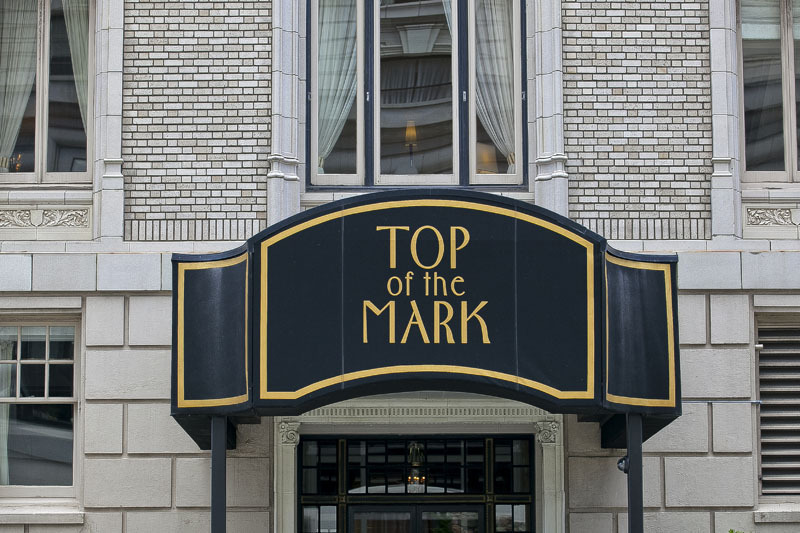 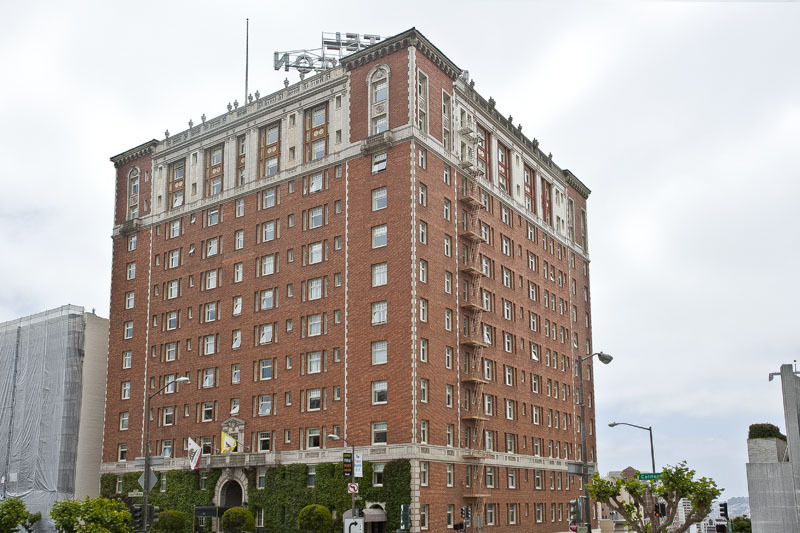 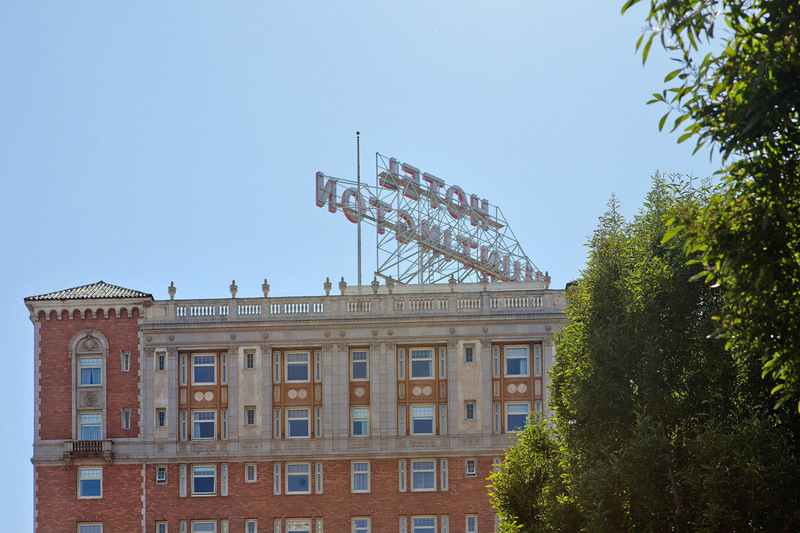 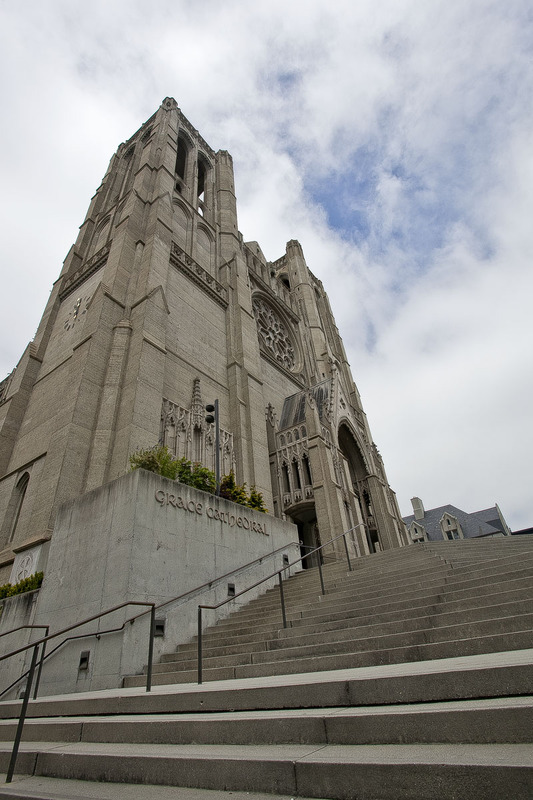 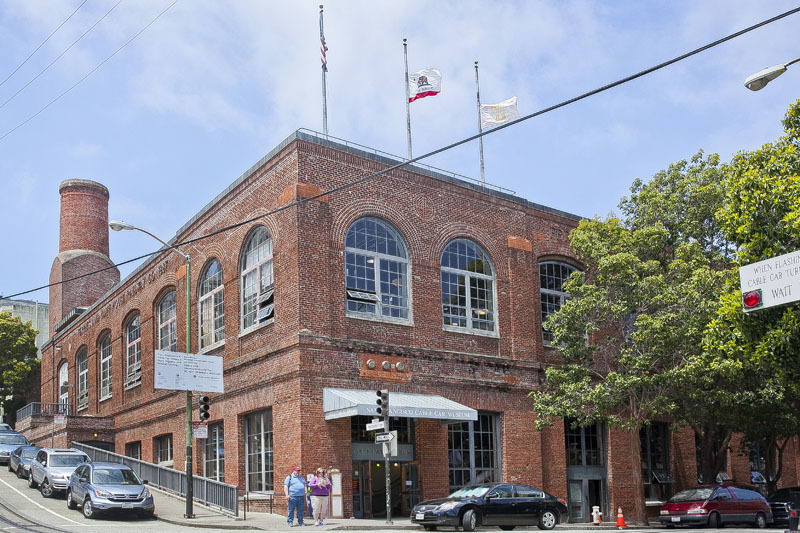 The area is considered the center of old San Francisco, where even today descendants of some of the original founding families of San Francisco keep continued memberships at renowned private clubs, including the infamous Bohemian Club.